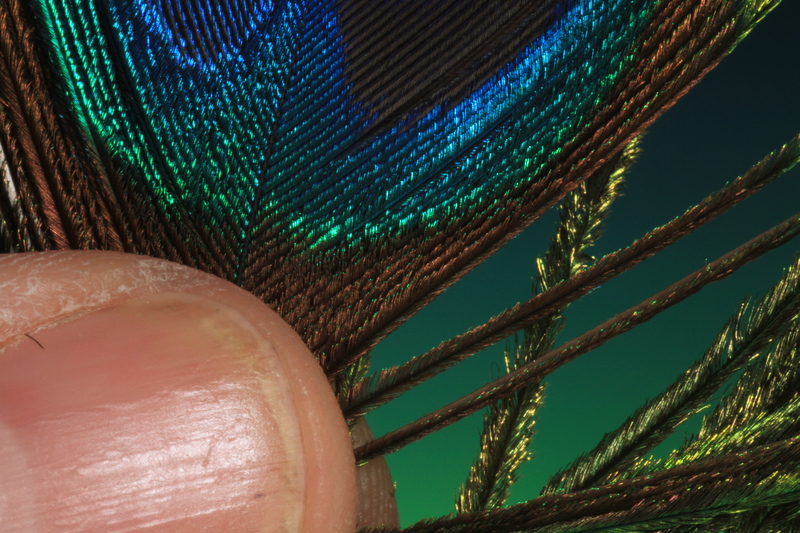 UVF is the fluorescent wavelength in bright colours we know from paints and dyes. 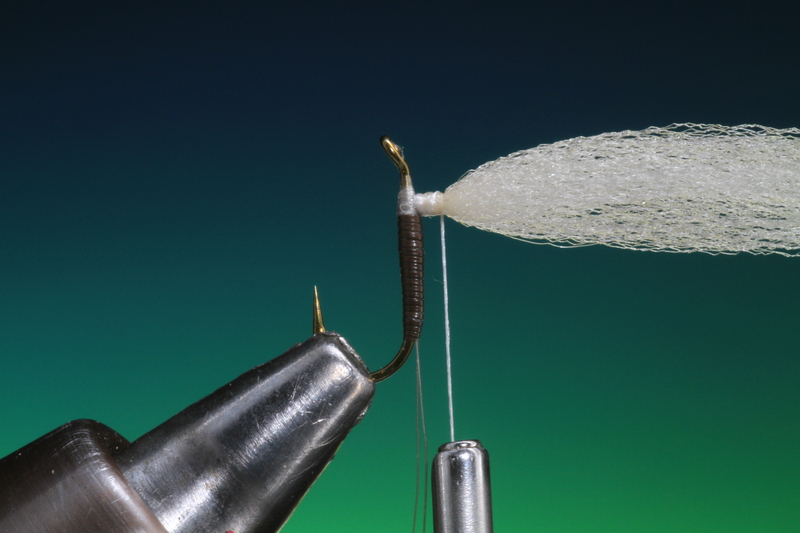 This can be an advantage in different light and water conditions and colours. 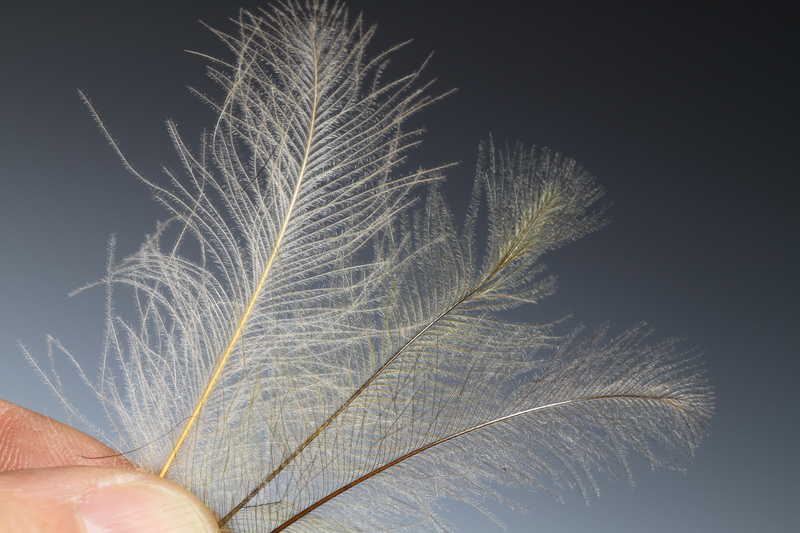 UVR or Ultra Violet Reflectance is a UV light that cannot be seen with the naked eye for humans. 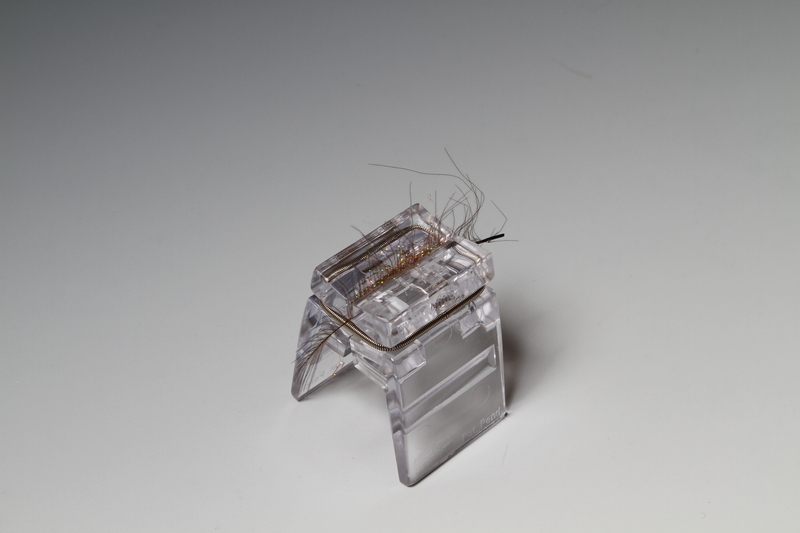 However it can be seen and is apparently used by most insects and animals. 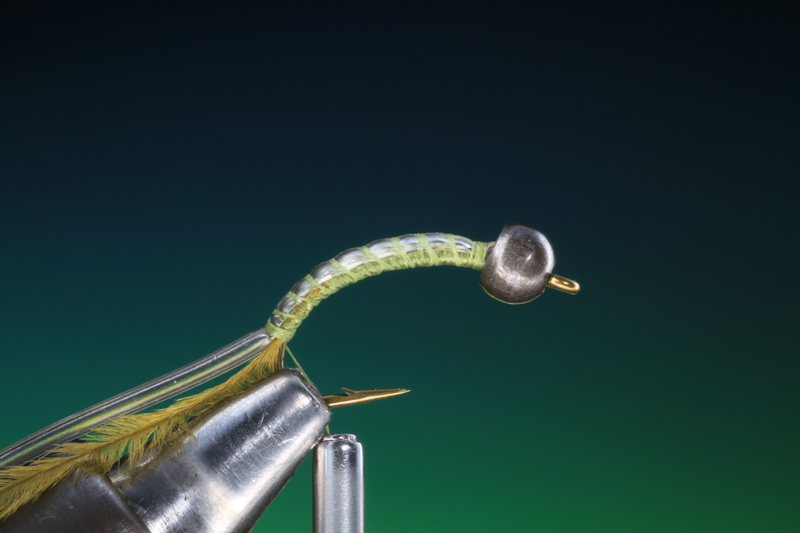 There eyes are constructed with different rods and cones that are tuned to UV wavelengths. 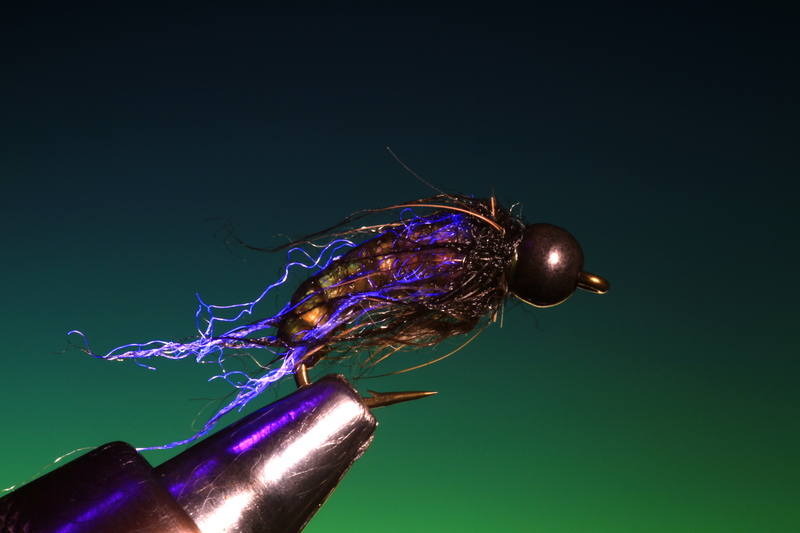 Although I have never used UV materials in my tying before with the exception of fluorescent flosses, threads and bead heads I am looking forward to tying and testing these new materials. 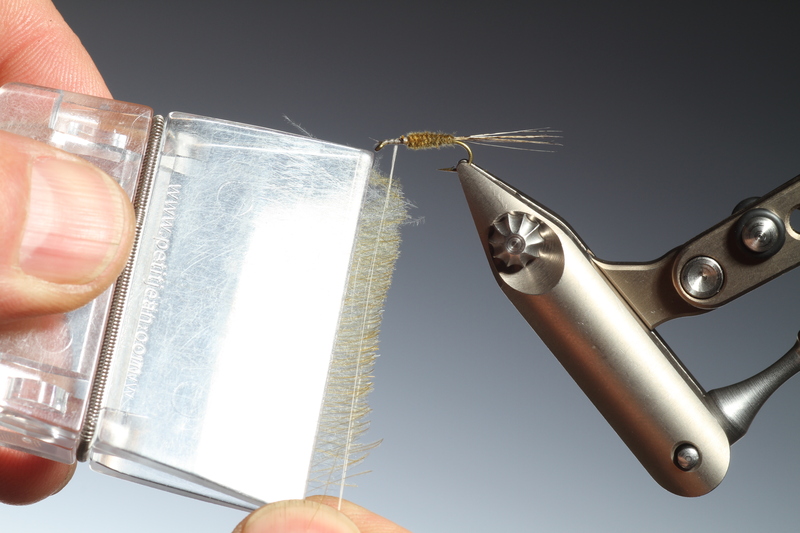 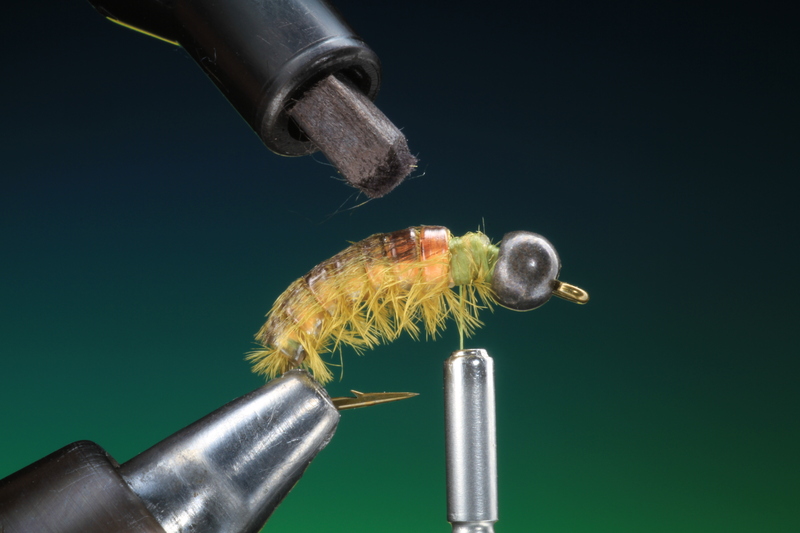 When it comes to pupa I, like many other fly tyers have tried to imitate the pupal shuck that a caddis pupa pumps full of gas to help it rise to the surface and separate the pupal shuck from the body when hatching. 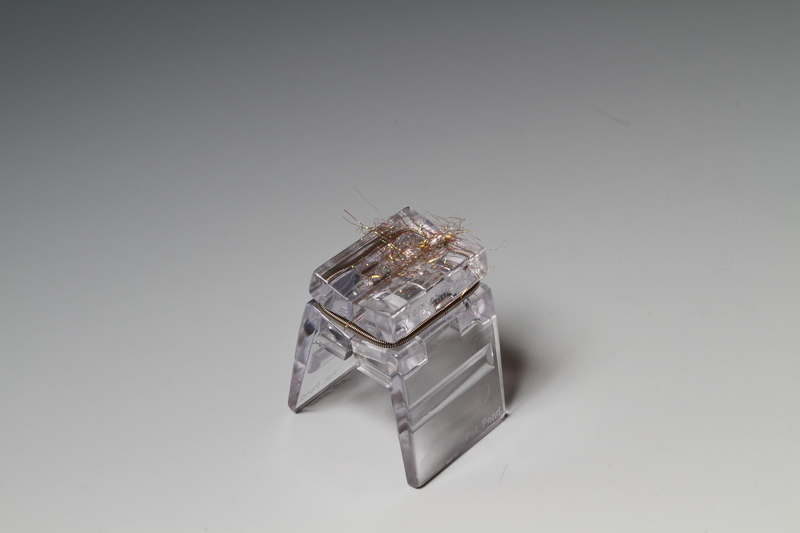 In the past I have done this with poly yarn and CdC as above. 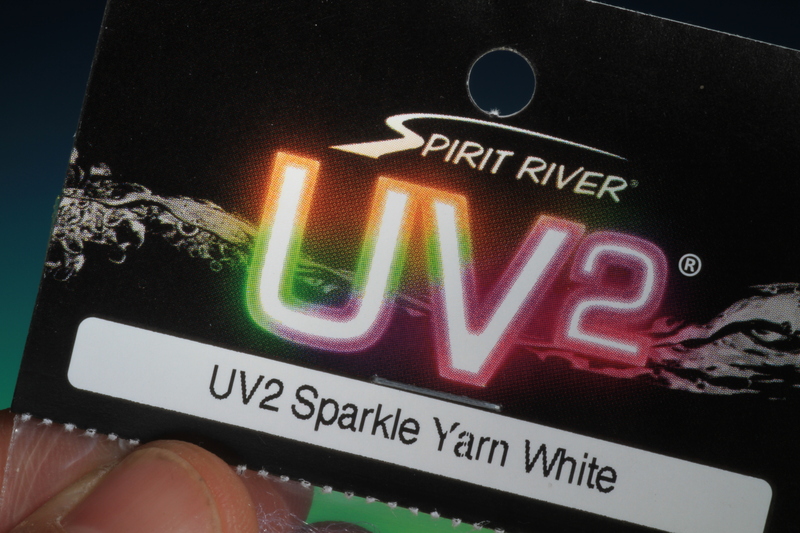 The new UV2 Sparkle yarn as seen in daylight is rather like the poly yarn forming a regular trailing shuck. 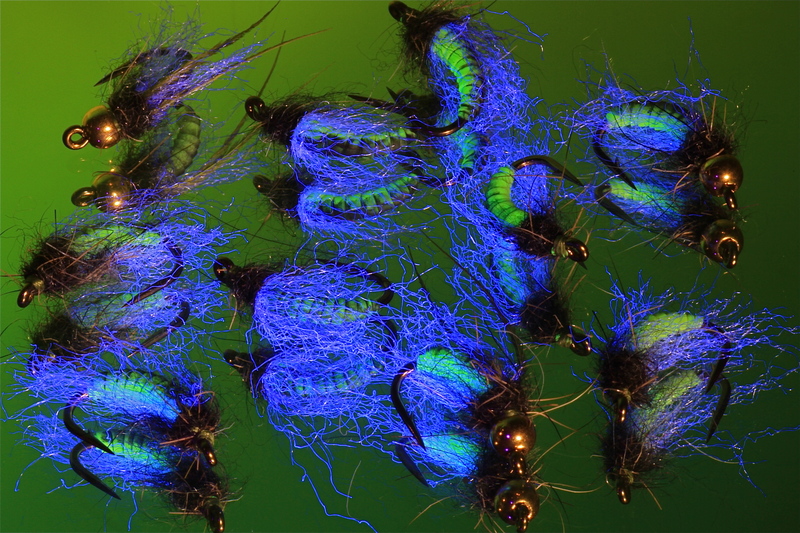 But when seen with UV light the sparkle yarn gives this a whole new dimension! 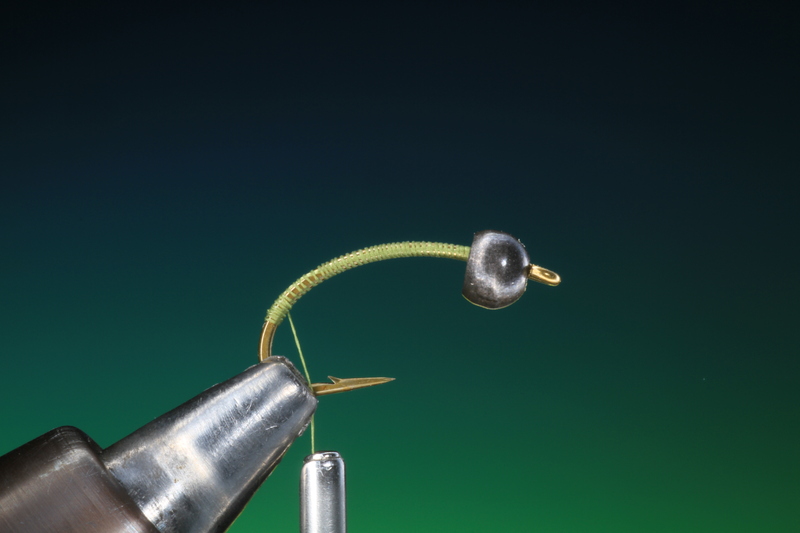 Secure your hook in the vice with the bead head of your choice attached. 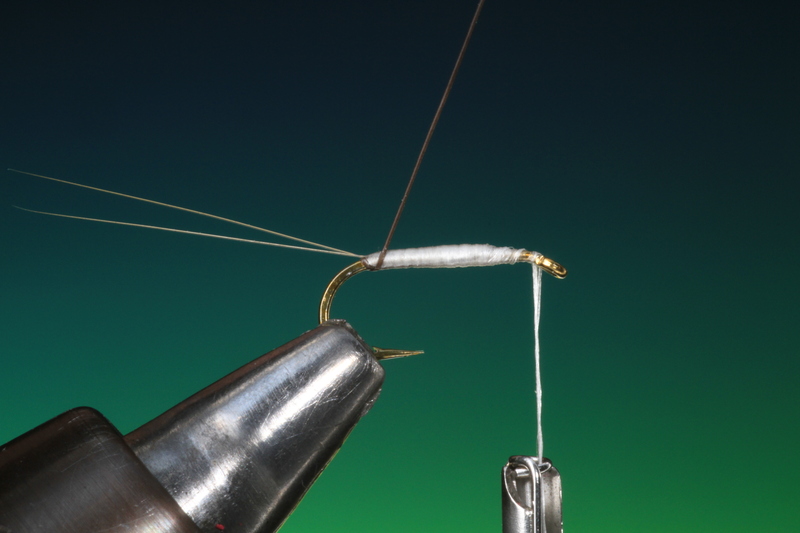 Run tying thread the whole length of the hook shank and down into the bend. 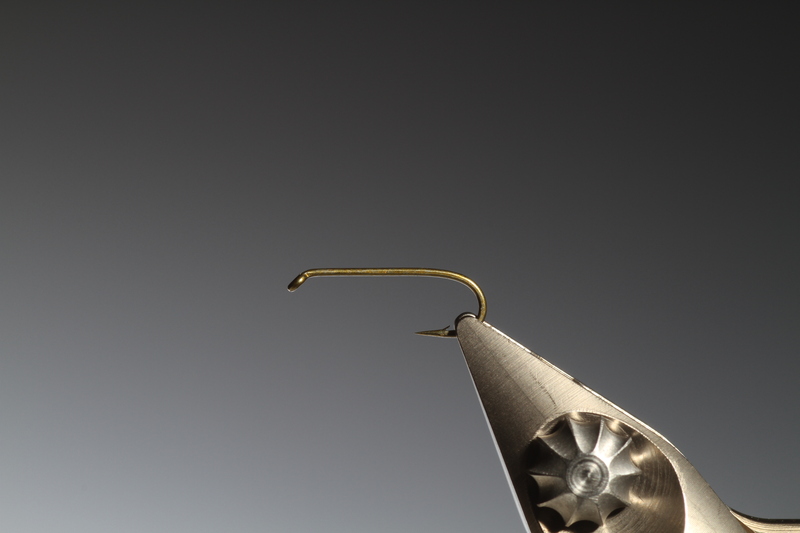 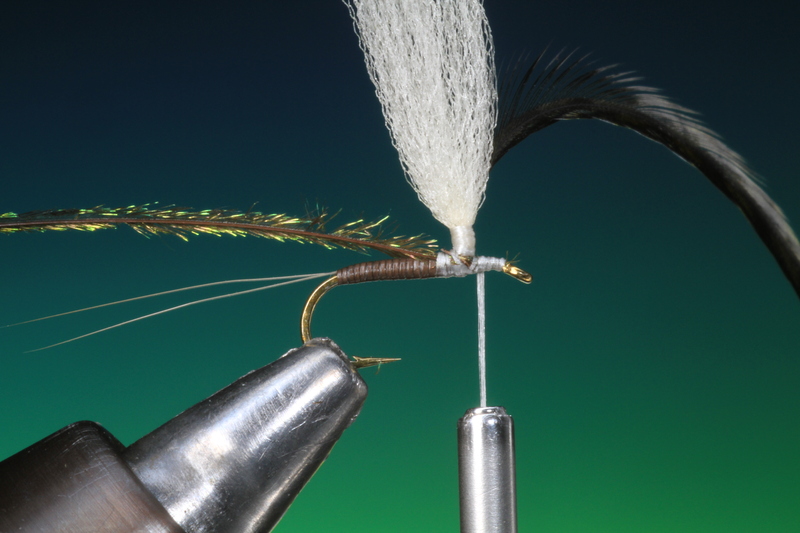 Tie in a long ostrich herl at the tail base of the fly. 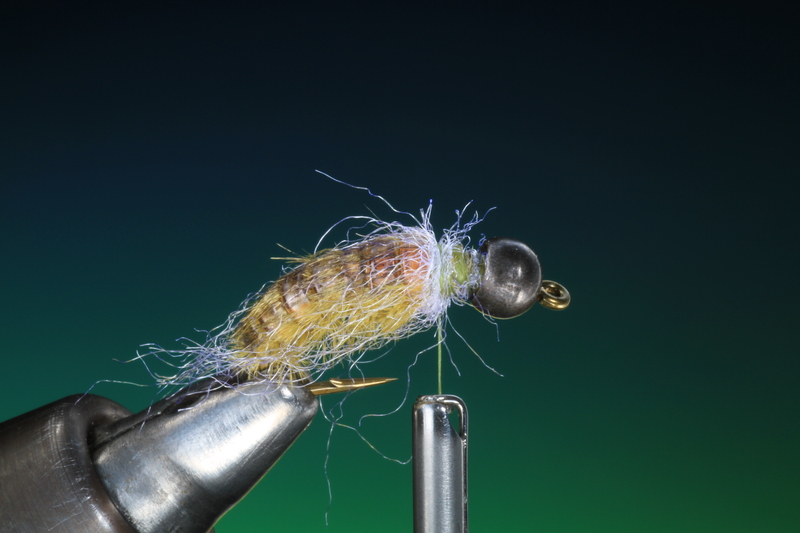 Cut a length of Larva Lace, the colour is your choice and push the end in the bead head and tie in. 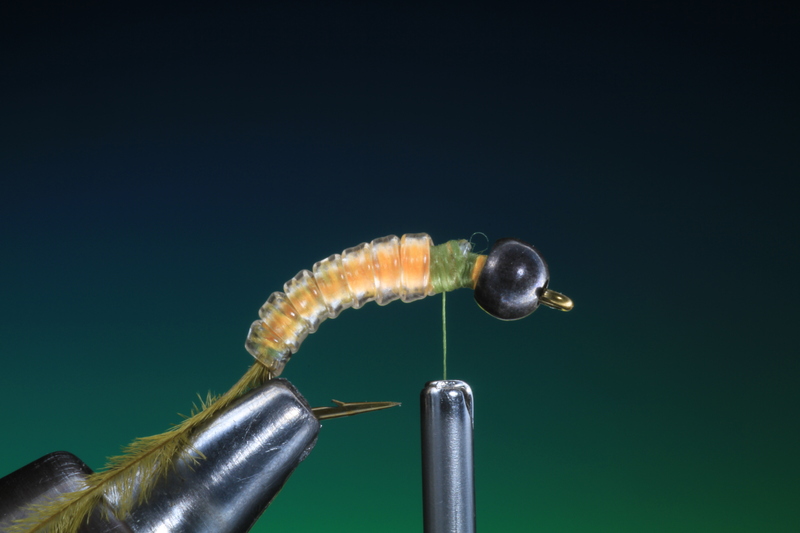 Wrap the tying thread all the way down to the tail of the fly securing the Larva Lace. 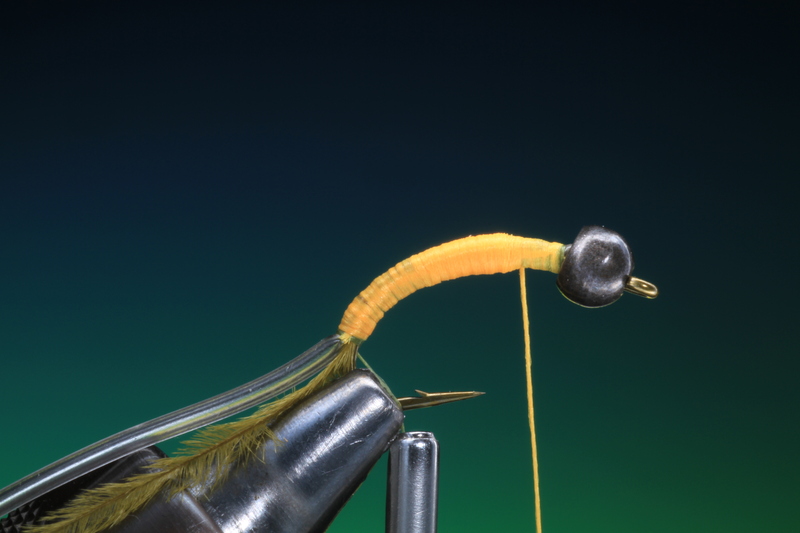 With another bobbin loaded with fluorescent floss, again the colour choice is yours, cover the whole body of the fly giving it a slight taper. 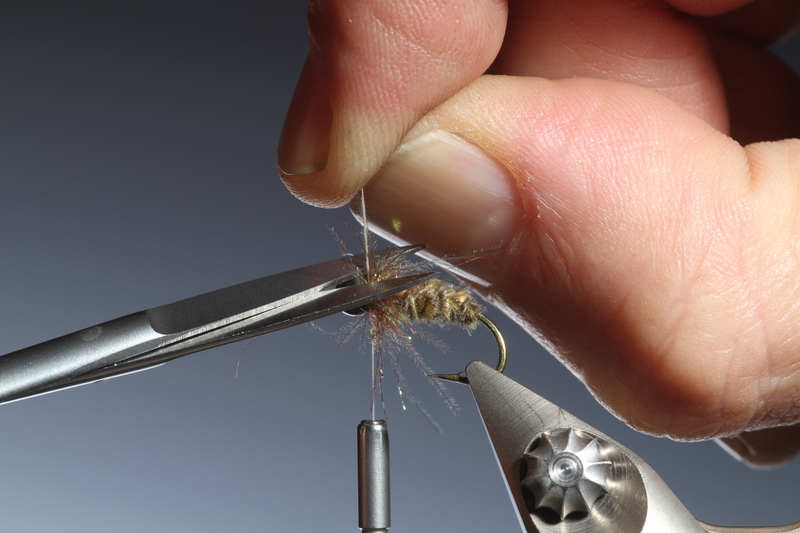 Tie off the floss and remove. 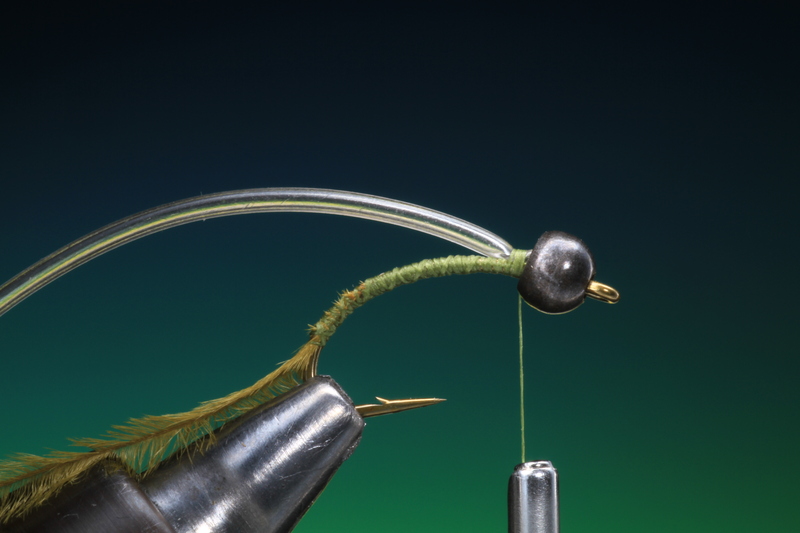 Wind your tying thread forward to the bead head. 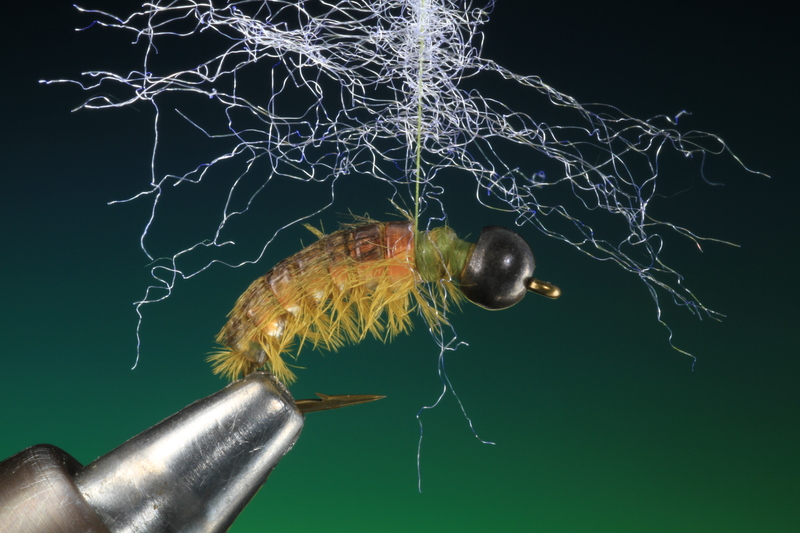 Now wrap the Larva Lace in six or seven even turns up the body. 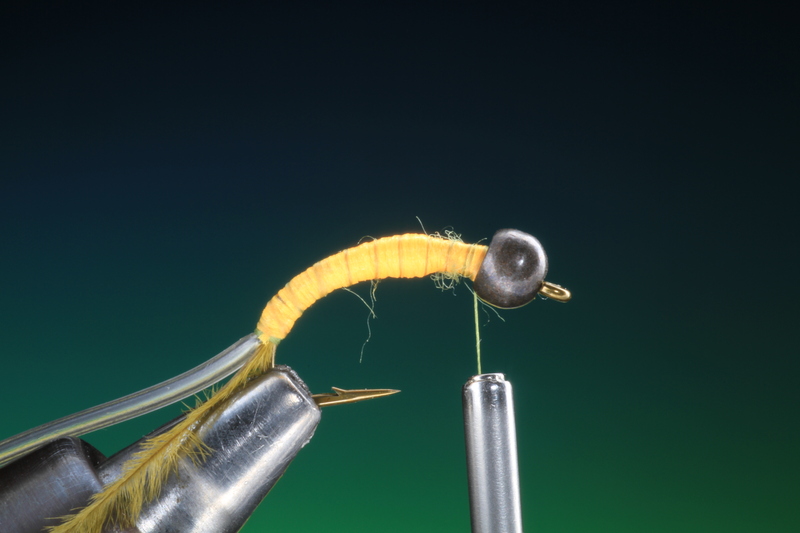 Dont wrap too tight! 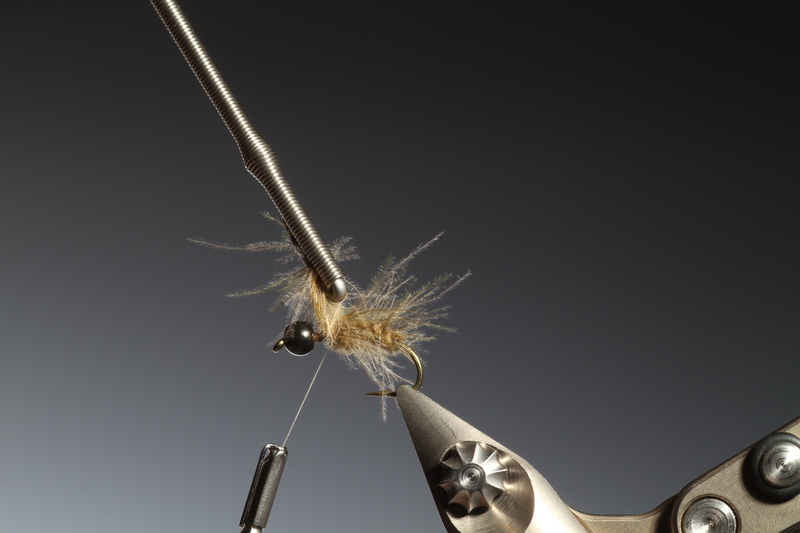 Tie off. 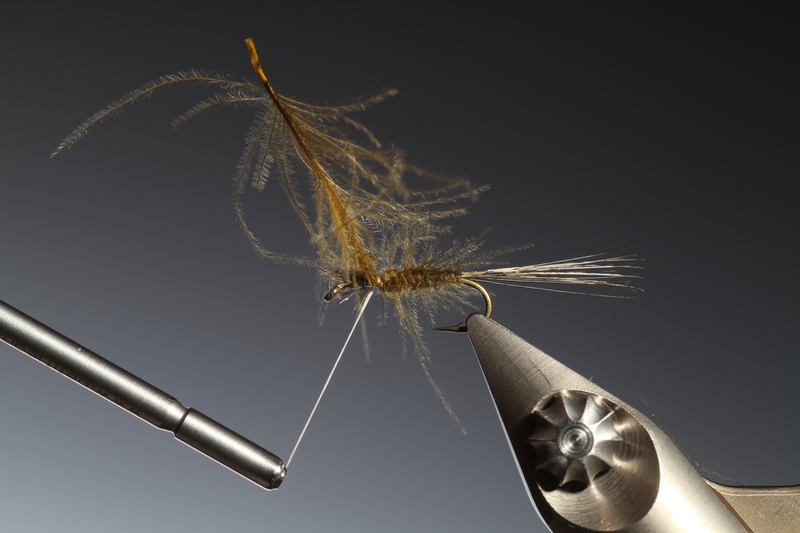 Now wrap the ostrich herl pulling each turn down into the open rib of the Larva Lace. 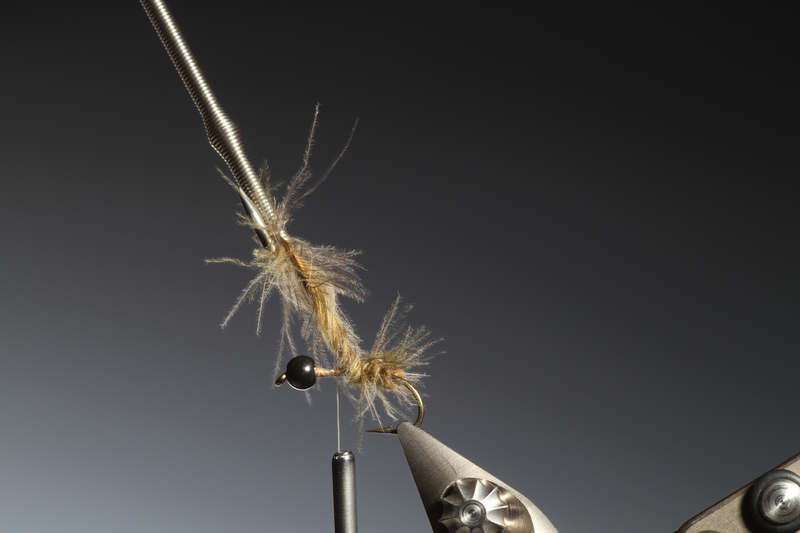 This will make it more durable to small sharp fish teeth and tie off. 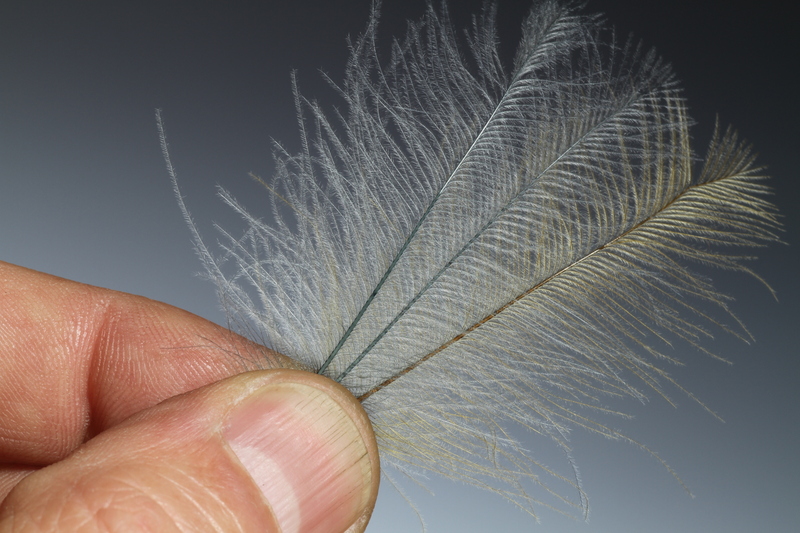 Run a water proof felt pen down the back of the body. 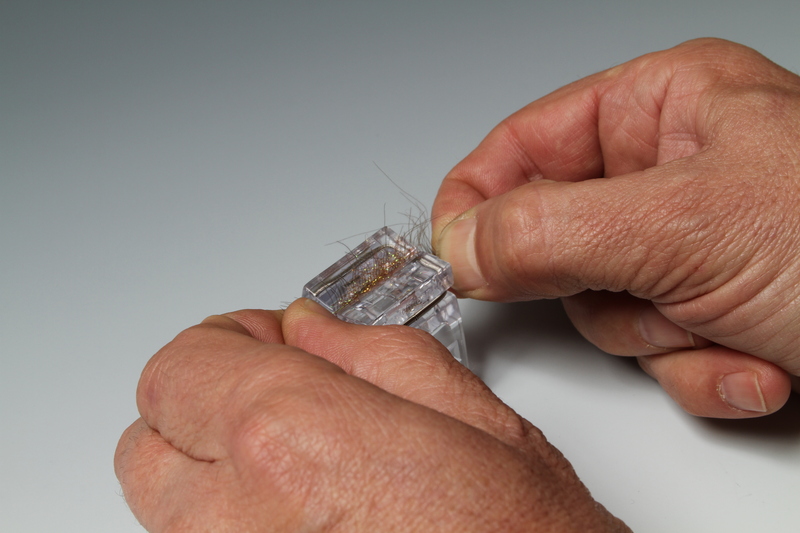 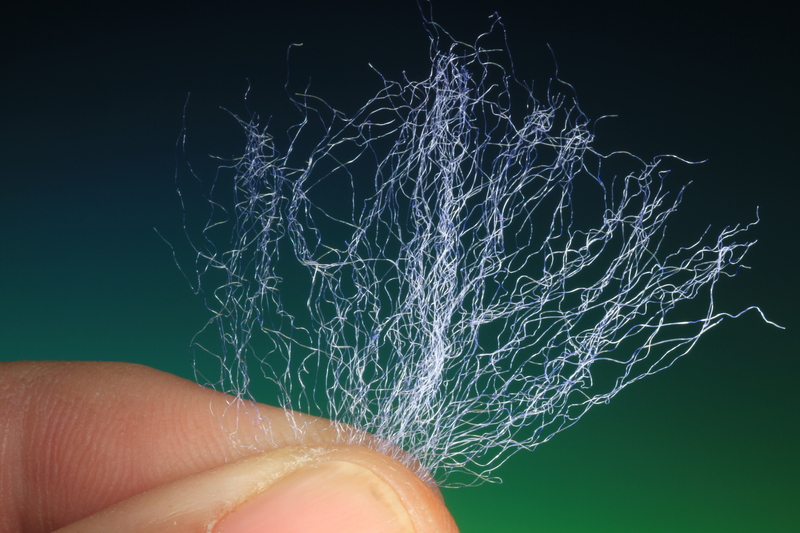 Cut a short length and open the fibers as shown. 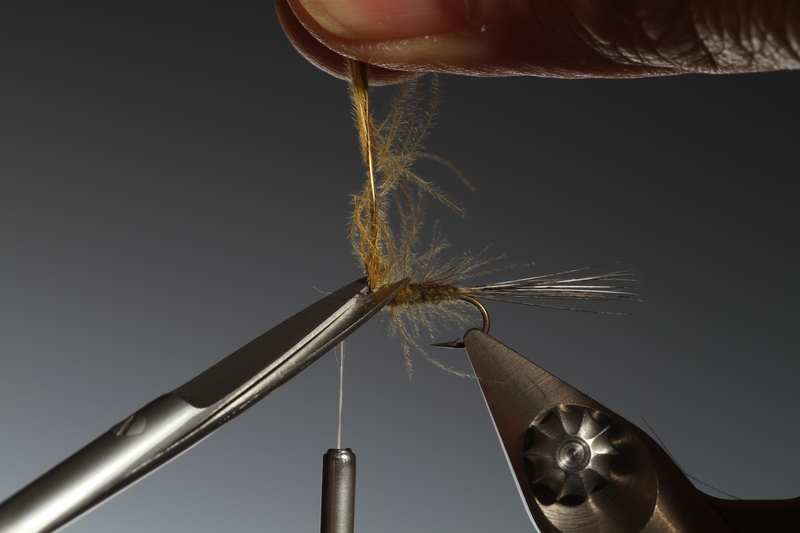 Split your thread or make a dubbing loop and just catch the ends of the fibers in the loop before you spin it to make a dubbing brush. 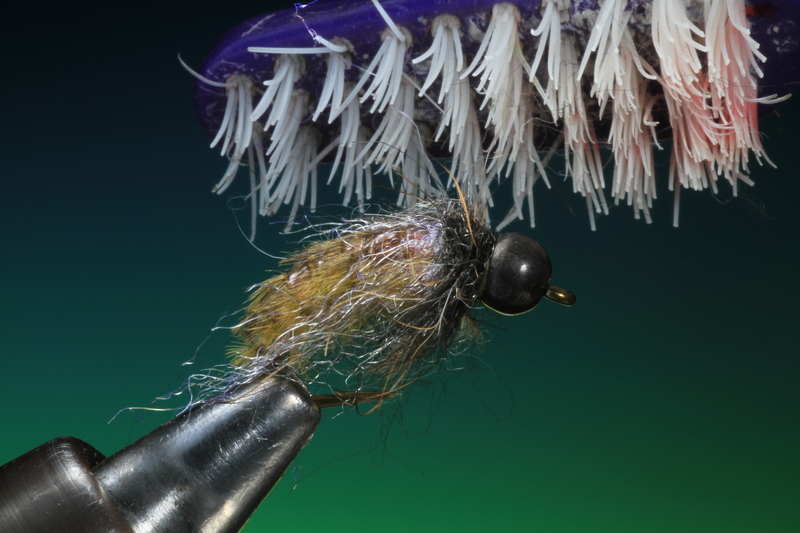 Wrap the dubbing brush around the whole collar of the pupa. 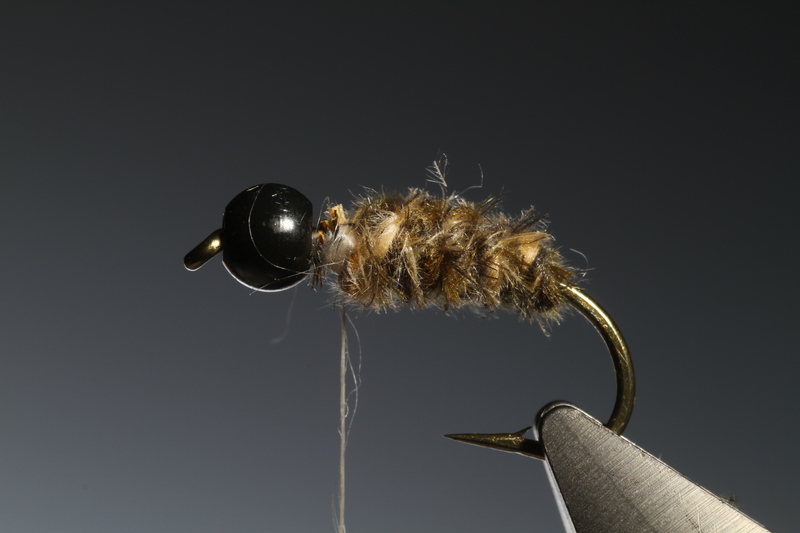 The yarn should be almost like a cloak covering the whole body if you want the correct shuck effect. 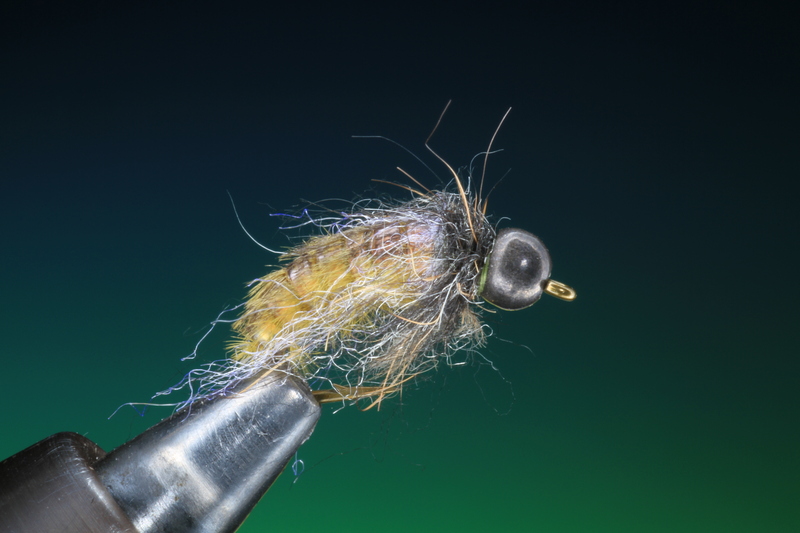 Now spin some Dazl-hares ear mix on to your tying thread and make wrap the collar. 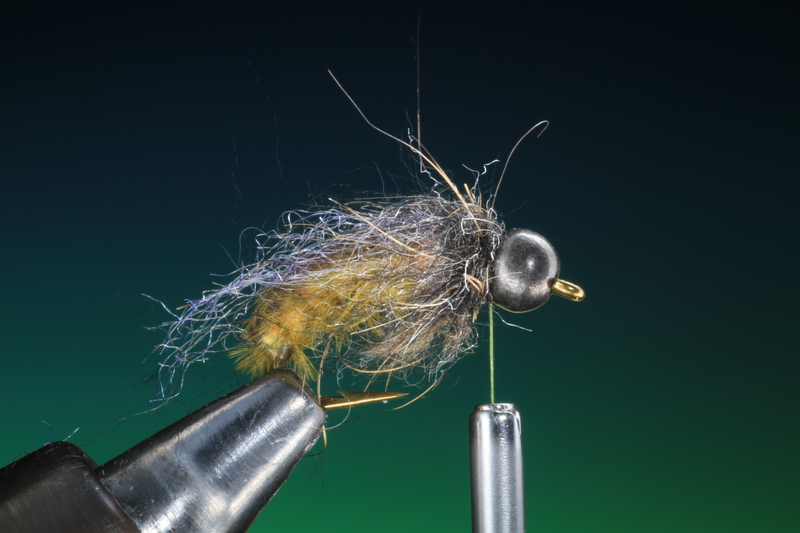 Wrap tight into the bead head. 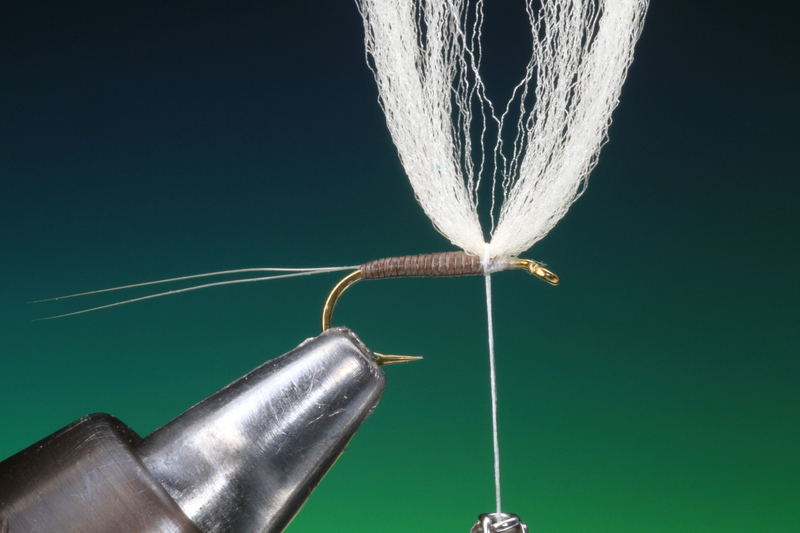 Whip finish and remove the tying thread. 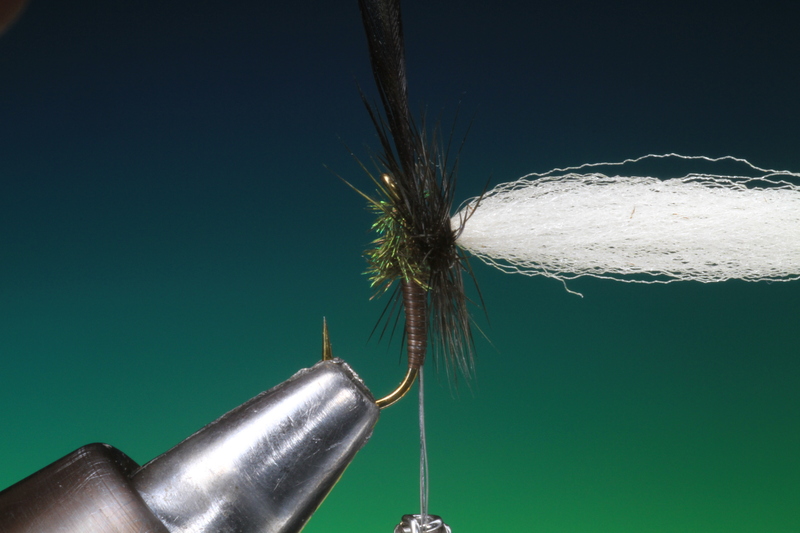 Give the collar and sparkle yarn a good brushing with a stiff tooth brush to tease out the fibers. 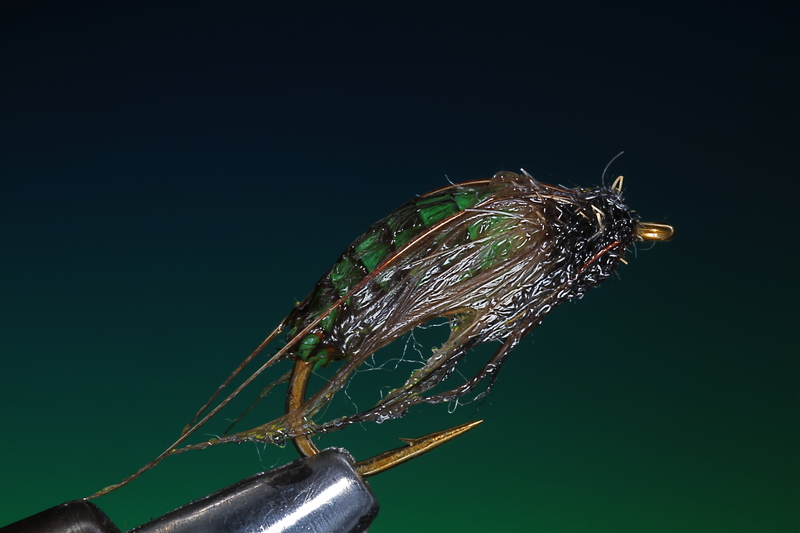 The finished UV Caddis pupa. 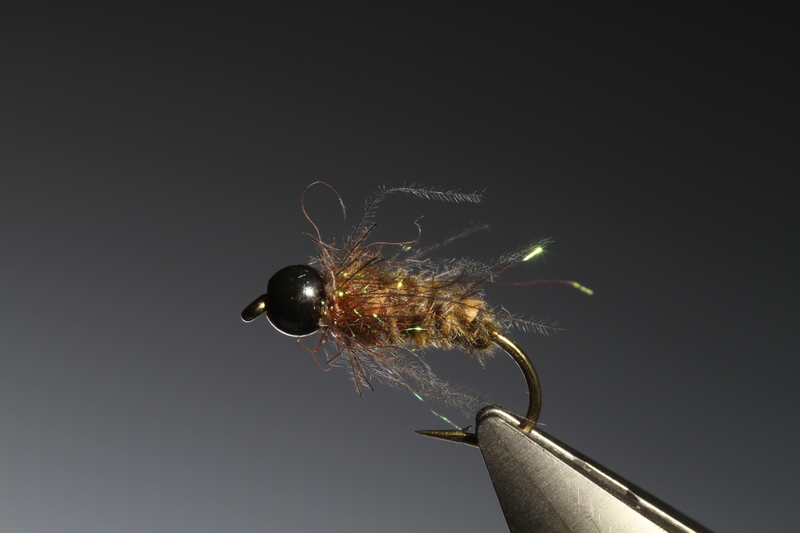 Its not until the UV Caddis is wet that it really comes to life. 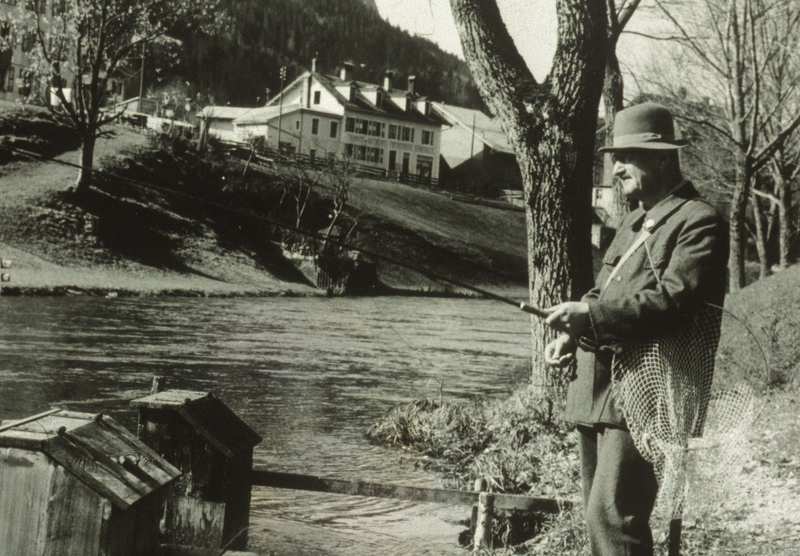 Charles Bickle one of the pioneers of CdC flies, standing on the bank of the Orbe river in Switzerland in the town of Vallorbe in the 1920s. 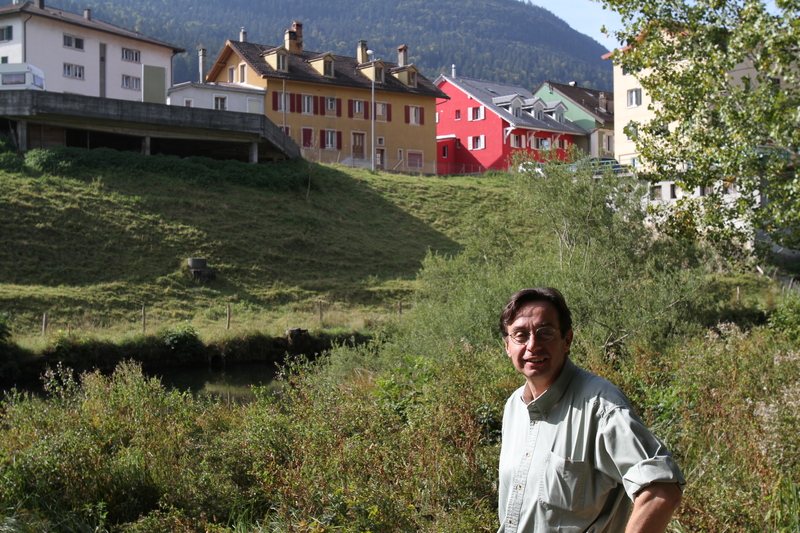 While visiting Marc at his home, although a little more overgrown, we managed to find the same spot on the river where the famous Bickle developed and fished the first CdC patterns. 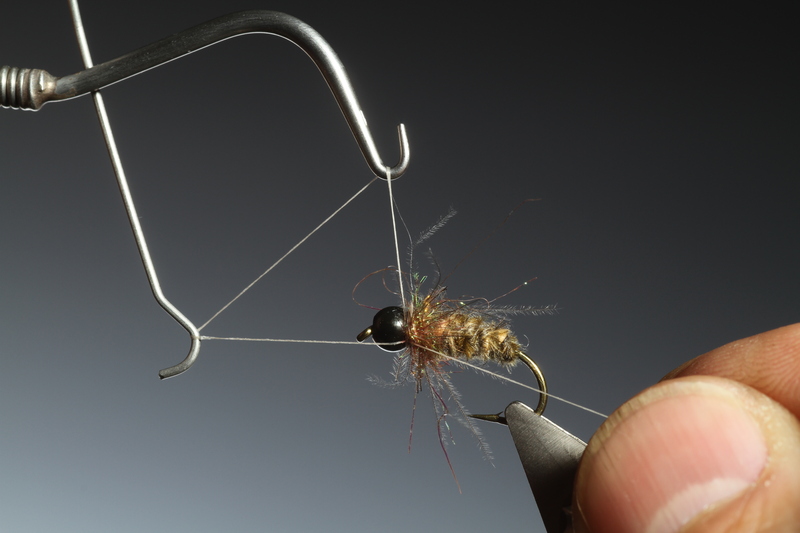 After a weekend with Marc Petitjean we managed to do a little fishing, although the conditions where not perfect and there was little activity in our local forest lakes, we did manage to make a few more tutorials. 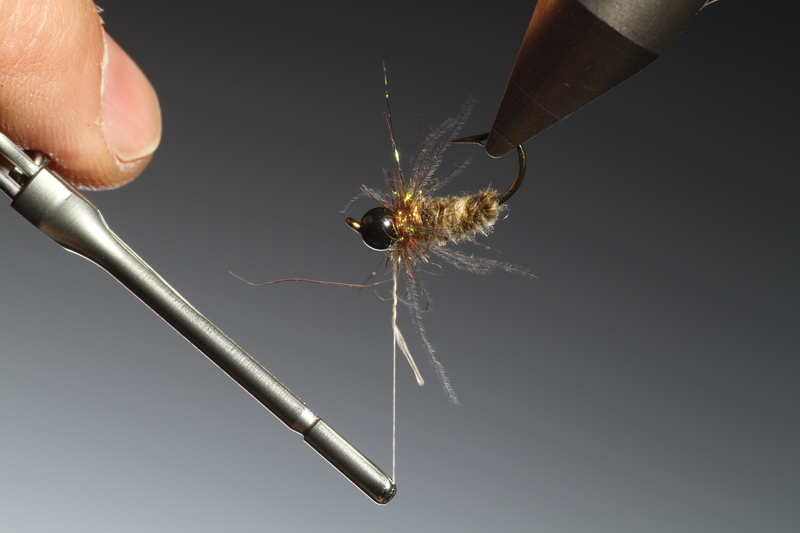 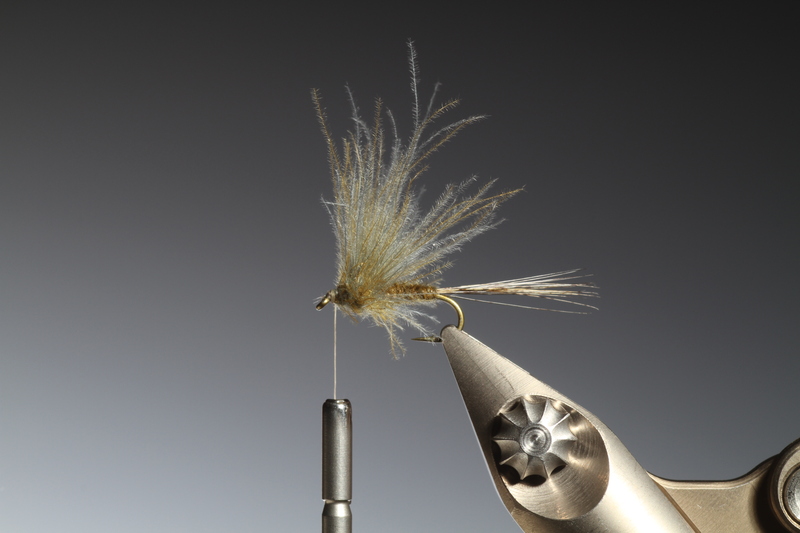 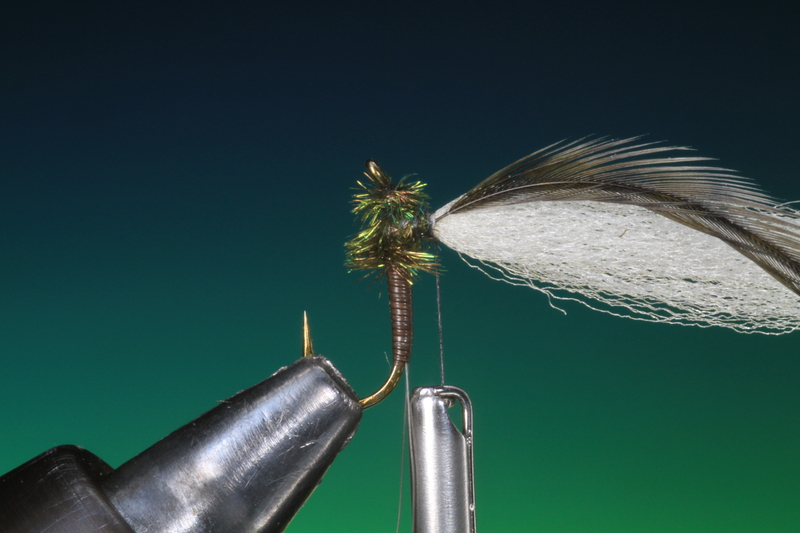 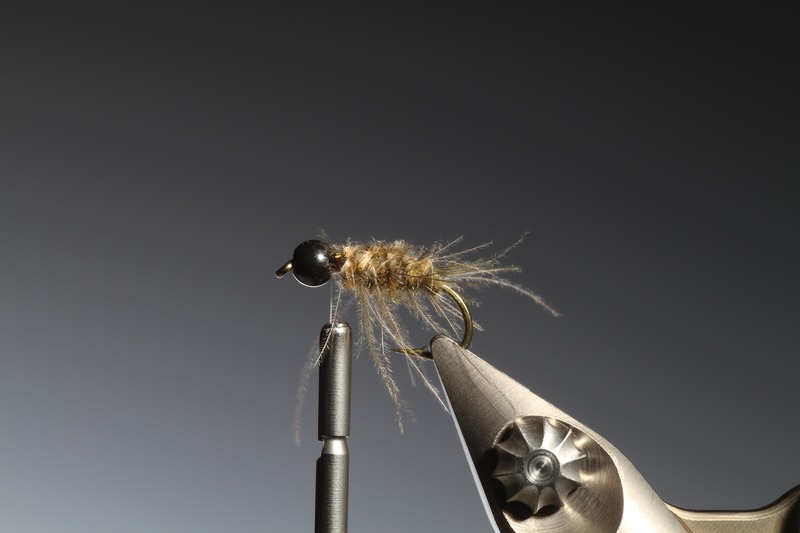 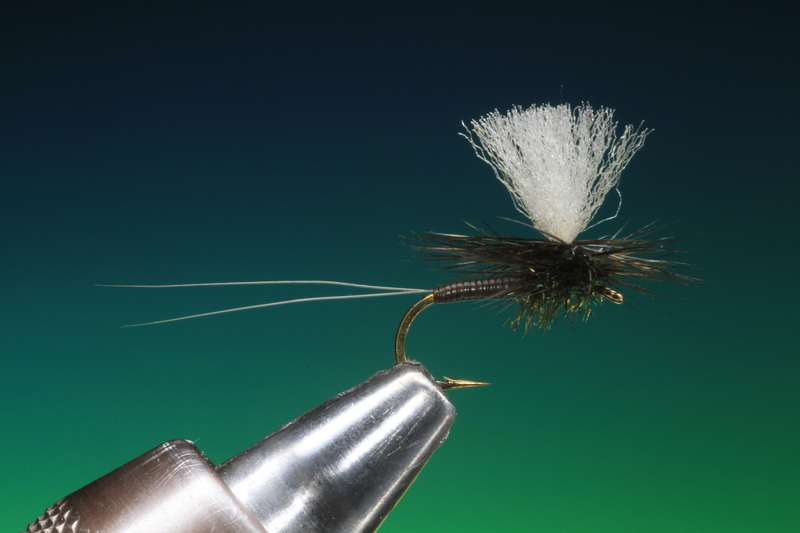 This first one, is one of Marc’s quick and easy CdC bead head nymphs. 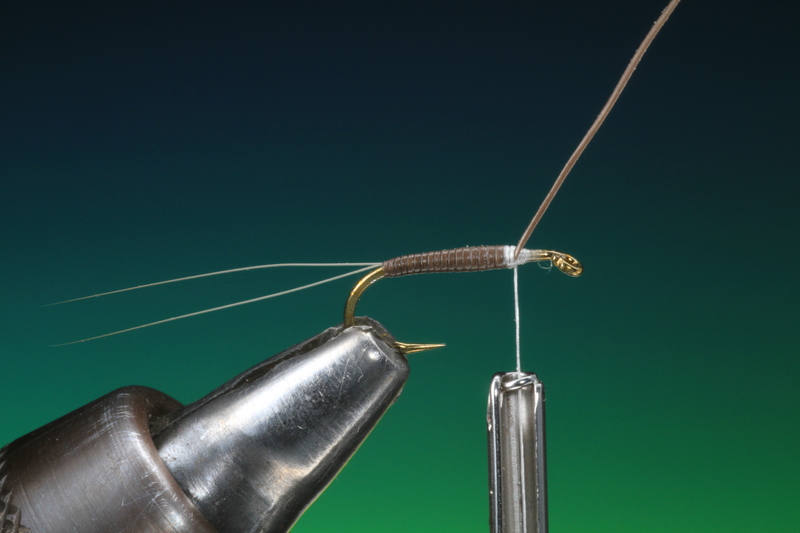 When Marc began tying nymphs with CdC ( nearly 20 years ago) many prominent anglers thought it was a joke! 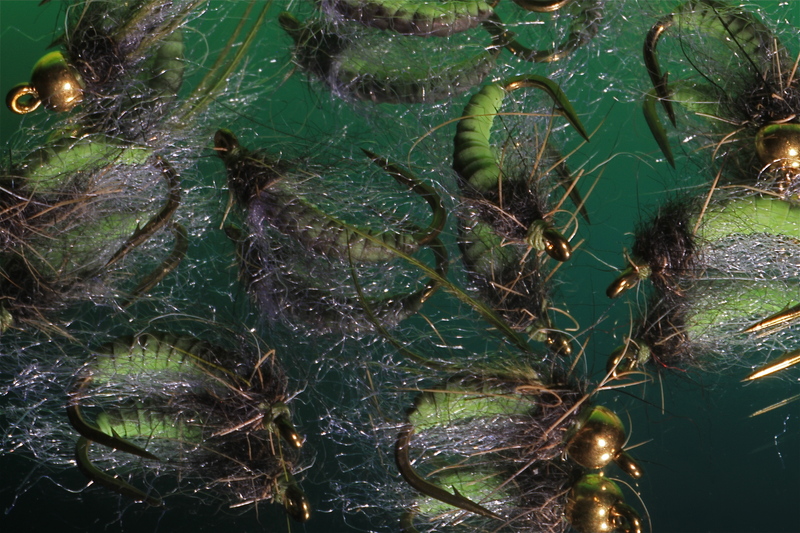 and that CdC was not a suitable material for nymphs, oh how time has proved them wrong. 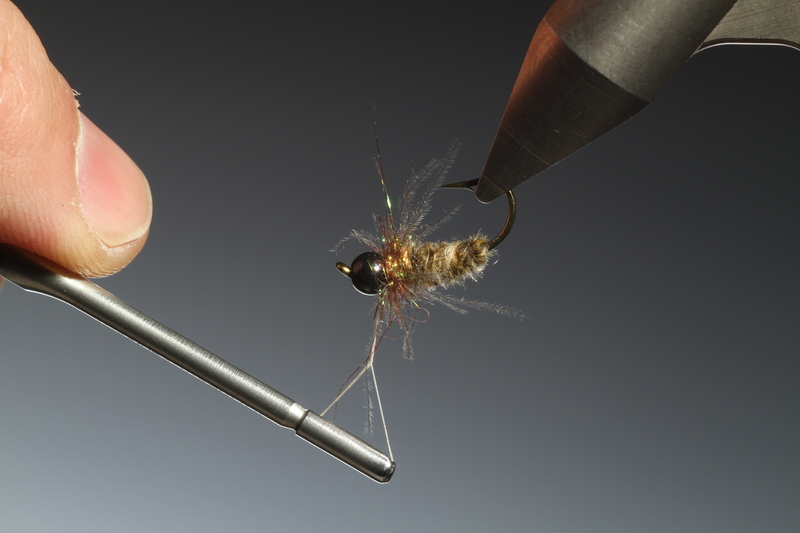 Over the next few weeks I will be posting several articles on Marc Petitjean patterns and his ingenious tools and how to use them. 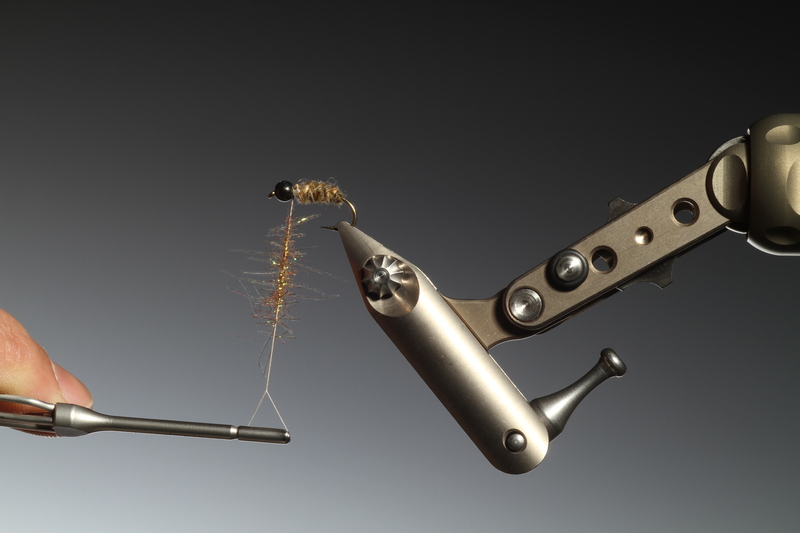 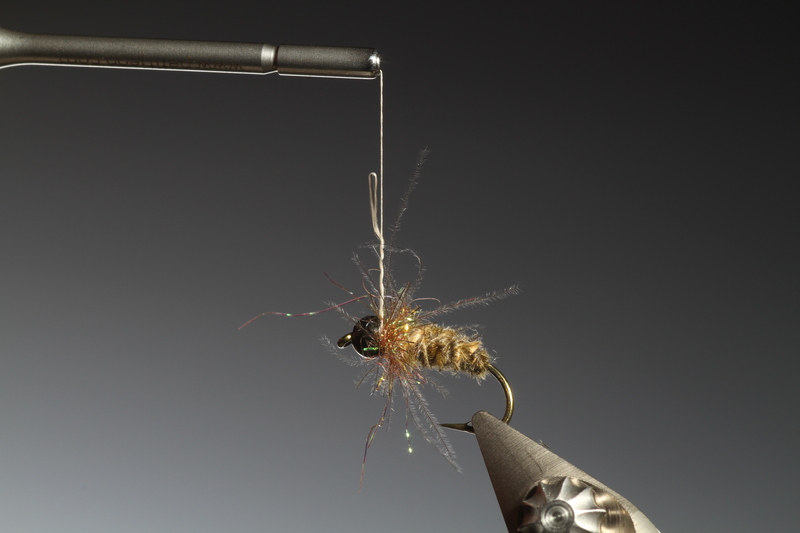 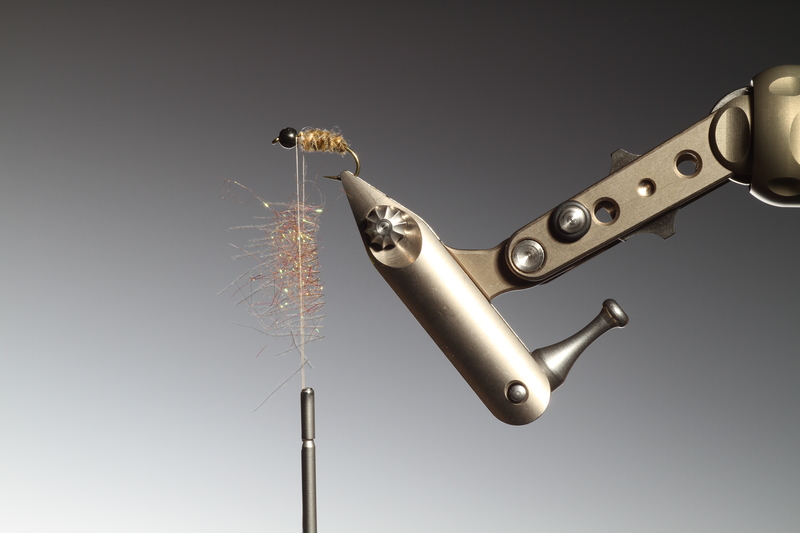 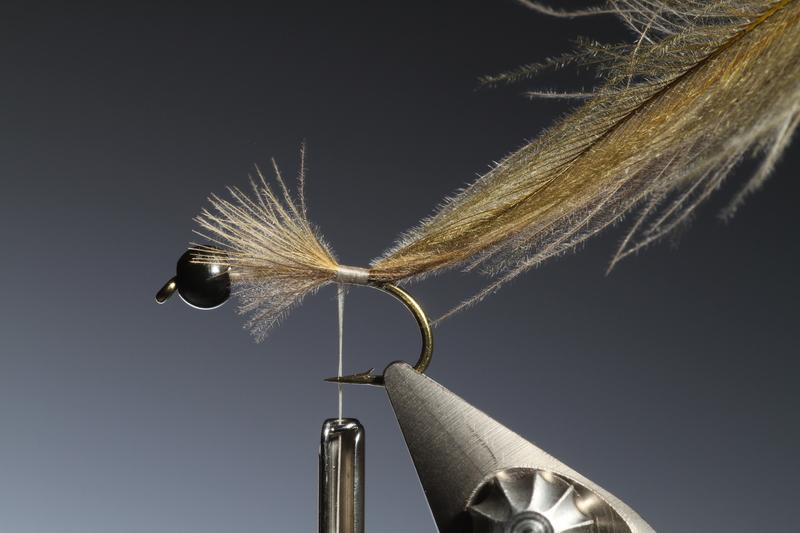 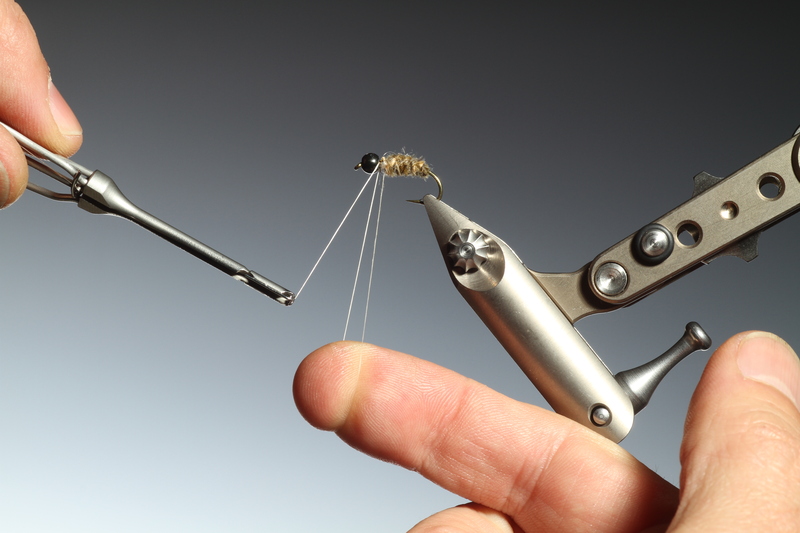 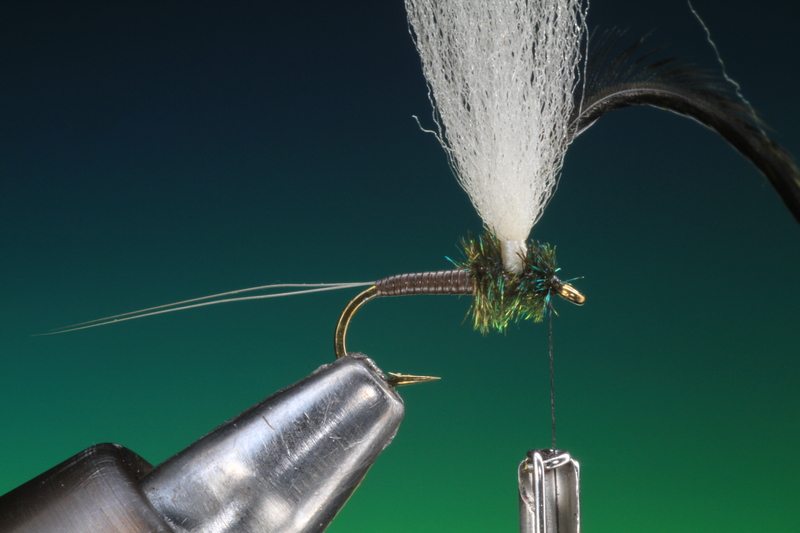 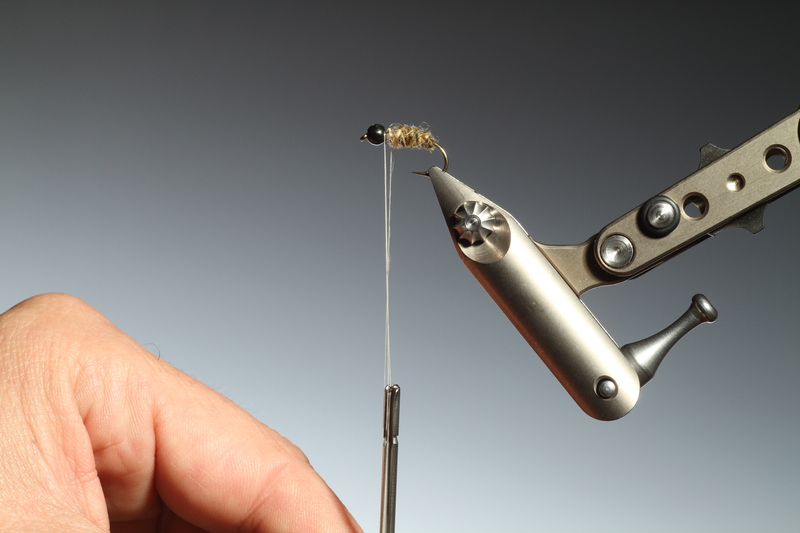 Place a bead head on the nymph hook and secure in your vice with the hook shank horizontal. 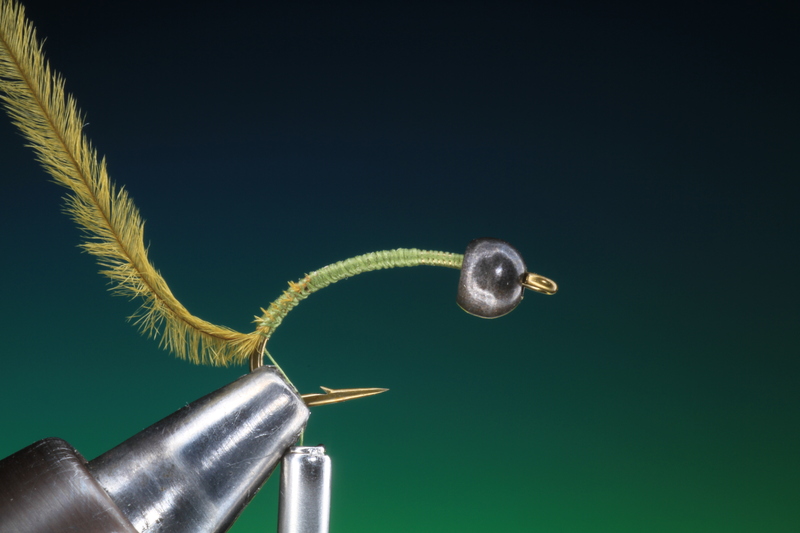 Wrap a short length of lead wire, enough to go into the bead head. 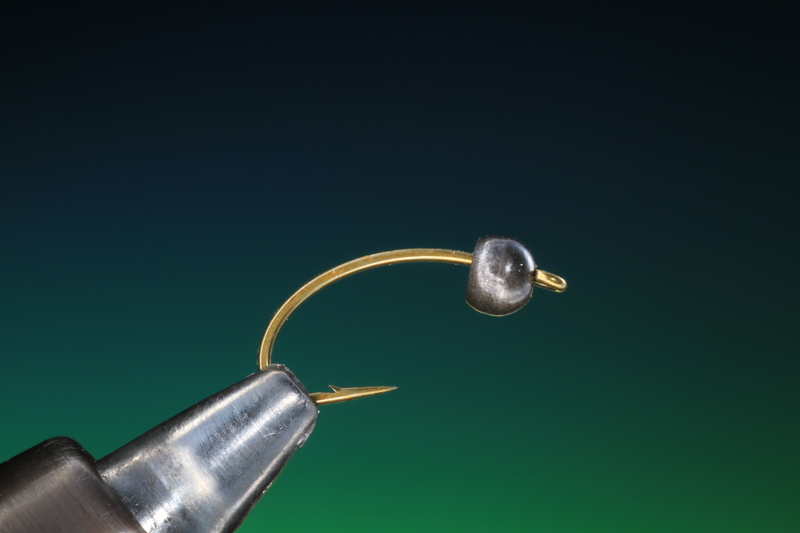 Using your nail push the wraps of lead wire into the bead head opening. 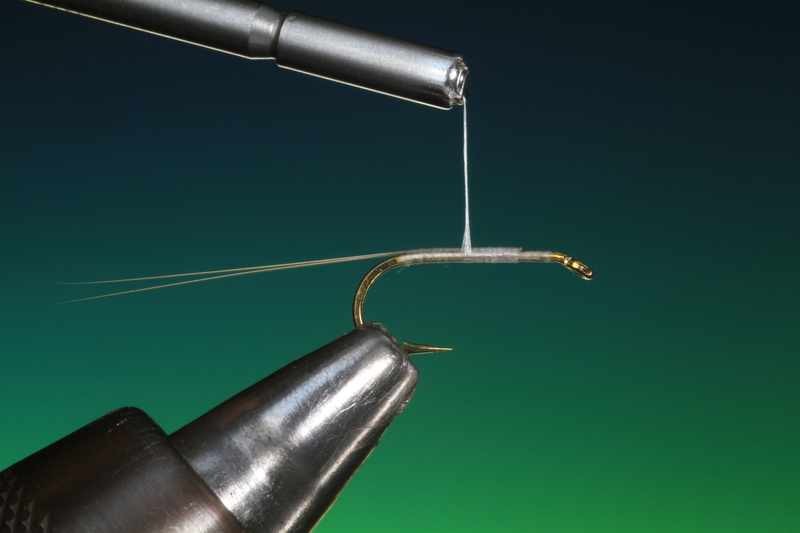 Attach your tying thread and make a few turns to hold the lead wire in place in the bead head and then wrap it back towards the hook bend. 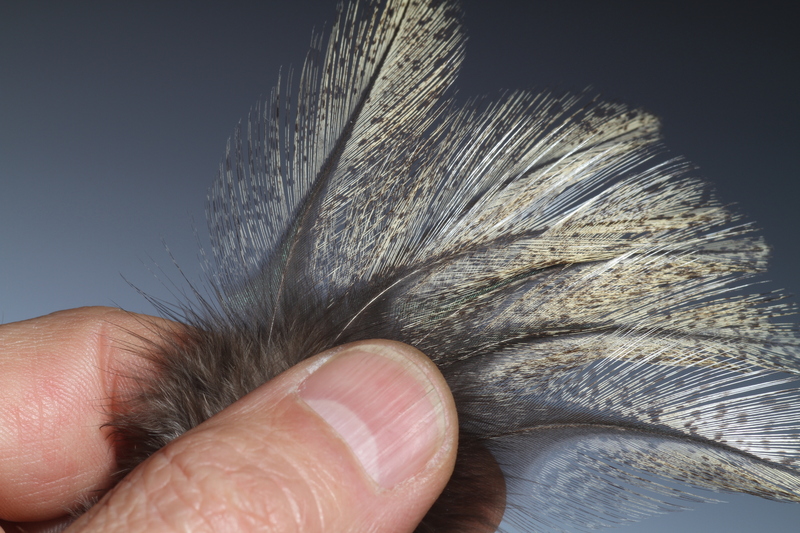 Select three CdC hackles of your colour choice approximately the same length. 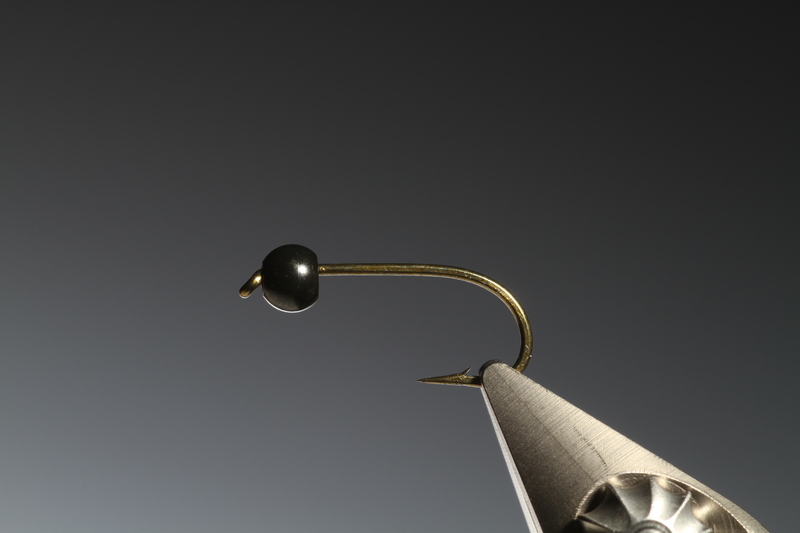 The choice of colours will determine the colour of the twisted segmented finished body, that has an almost woven effect. 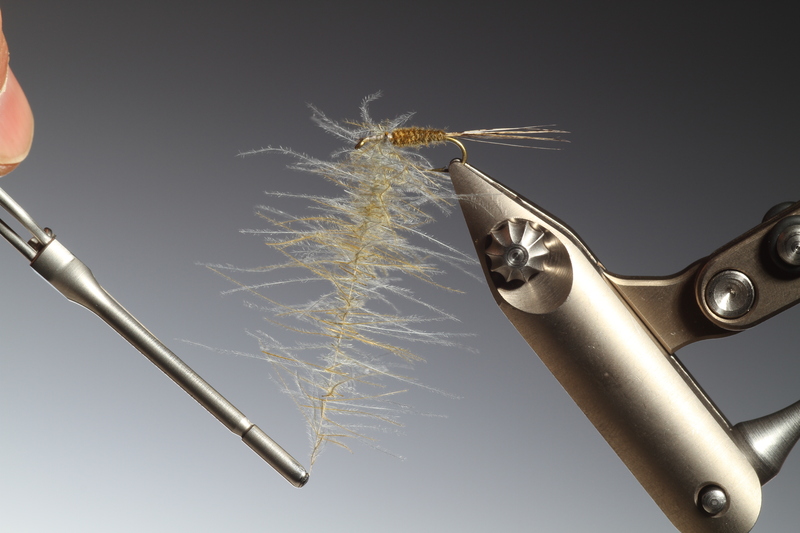 Tie in the ends of the CdC hackles as shown. 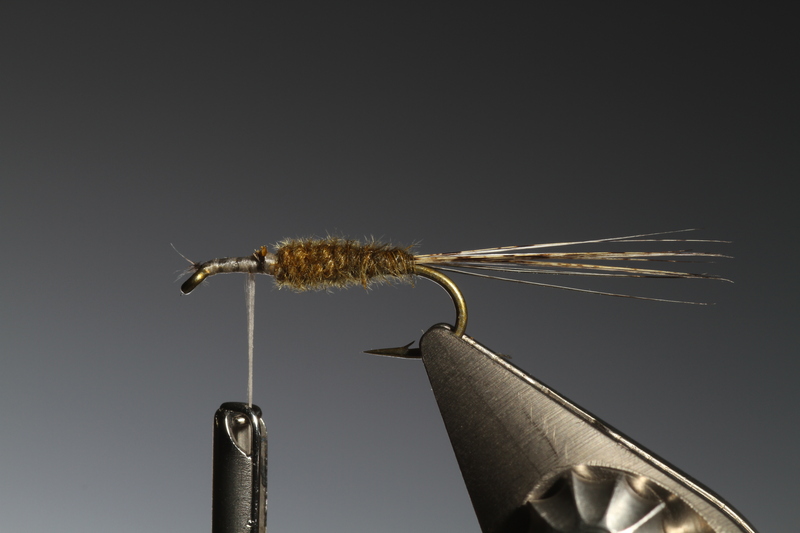 At the very end of the hackles attach the Petitjean hackle plier. 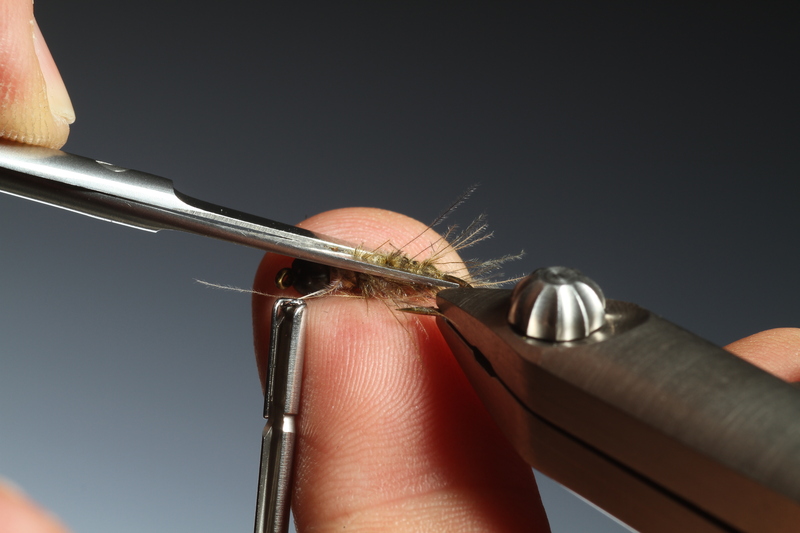 This technique can only be done successfully with Marc’s plier, it does not slip, even with three hackles in it! 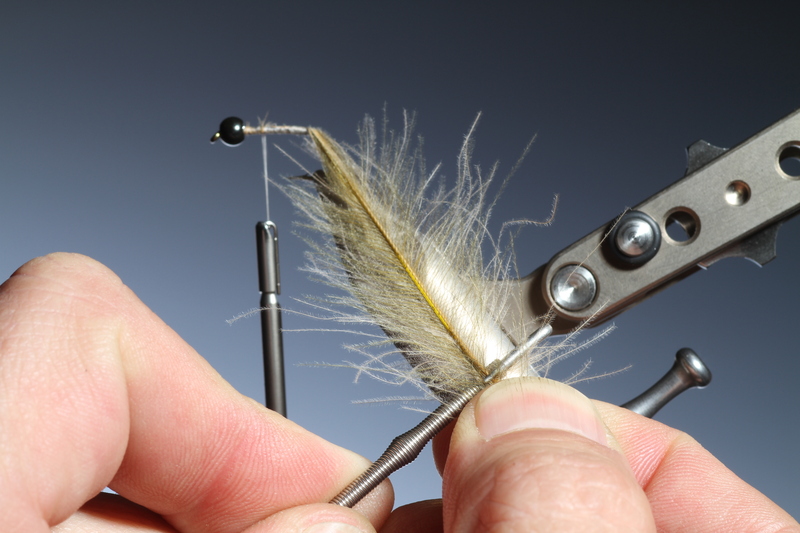 Now trim off the hackle shaft ends, close to the pliers. 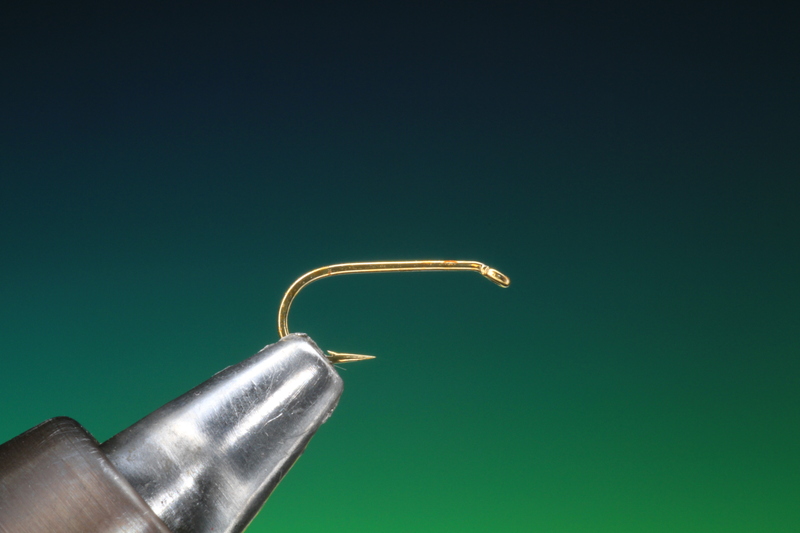 Now wind your tying thread forward about 2/3 of the hook shank. 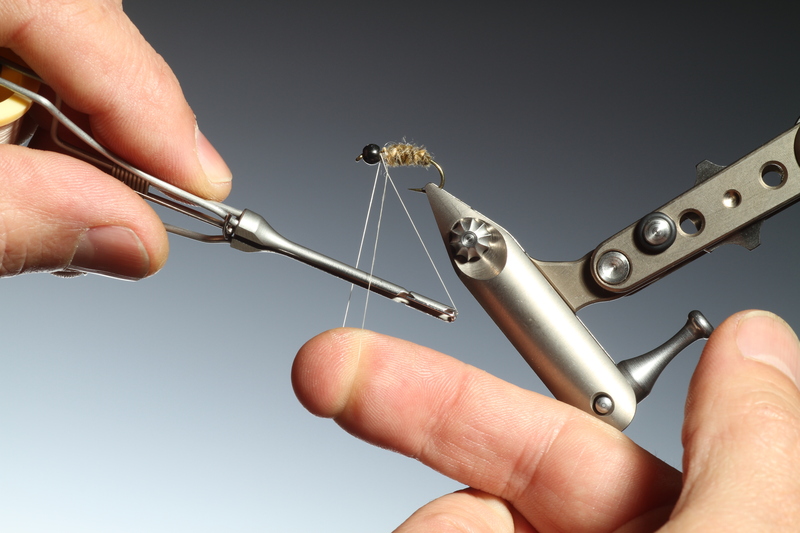 Take the pliers and twist the CdC only about three times. 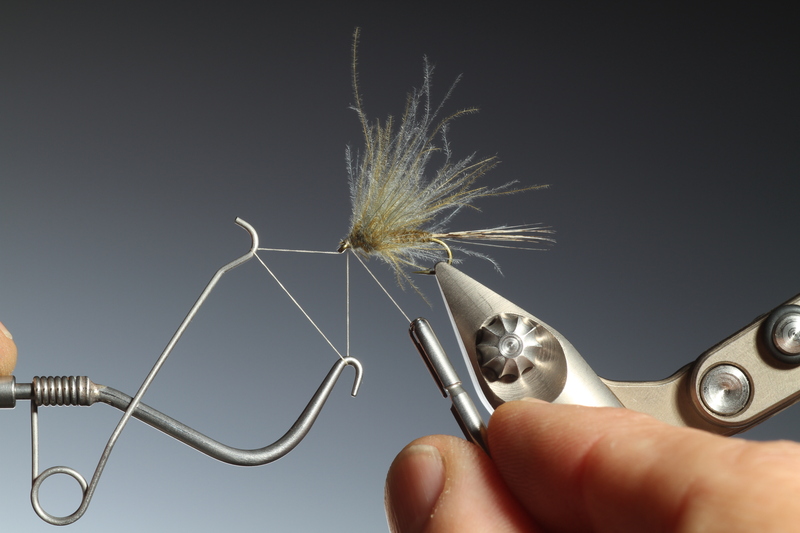 If you twist it more you will break the CdC hackle stems. 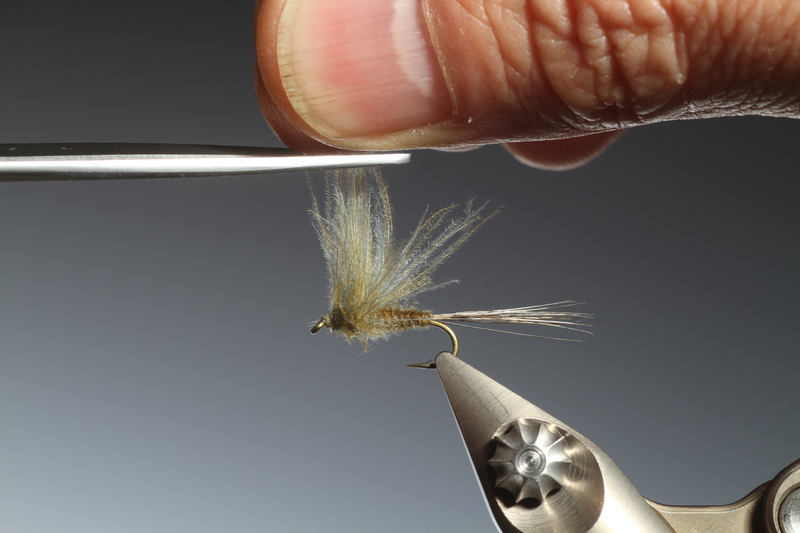 Begin wrapping the twisted CdC to form the body of the nymph. 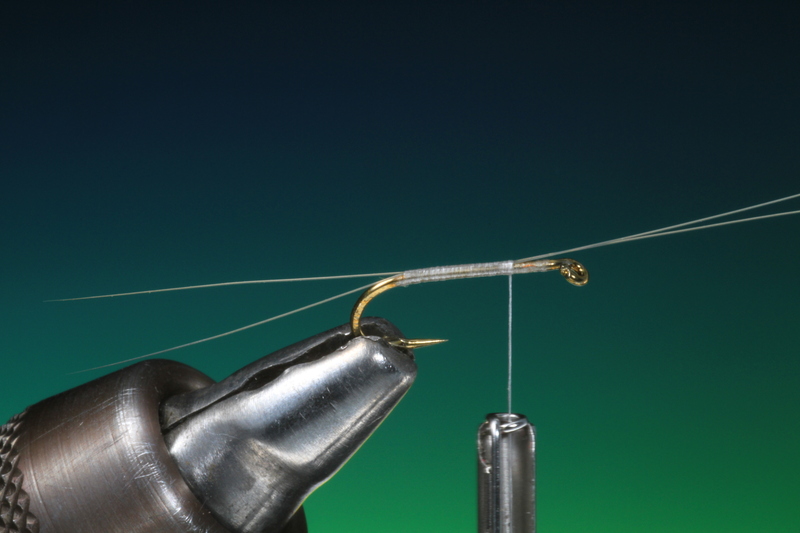 Marc calls this Twist and Wrap but only one twist for each wrap. 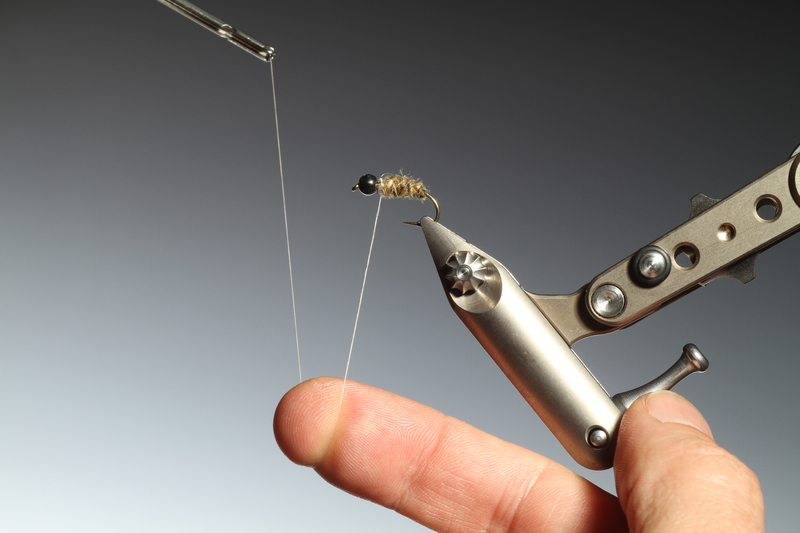 Continue until you reach the tying thread. 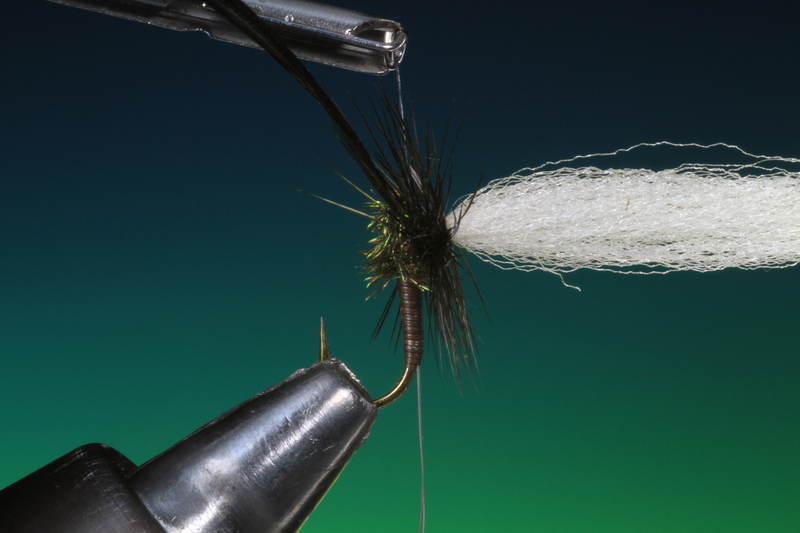 Tie off the CdC hackles. 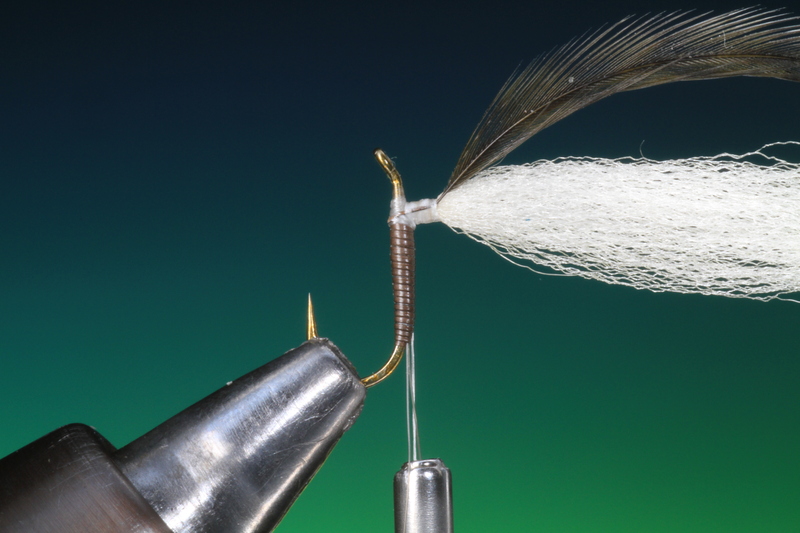 Trim off the excess CdC hackle stems behind the bead head. 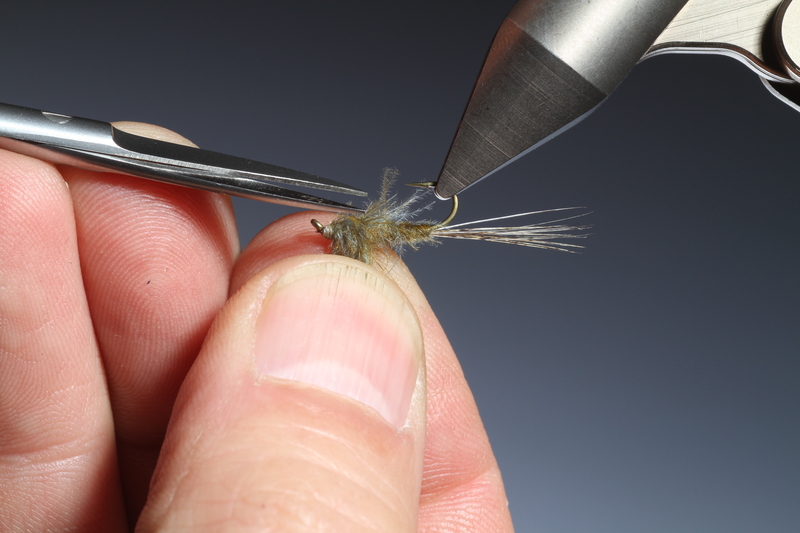 Carefully trim off the CdC fibers around the whole body of the nymph. 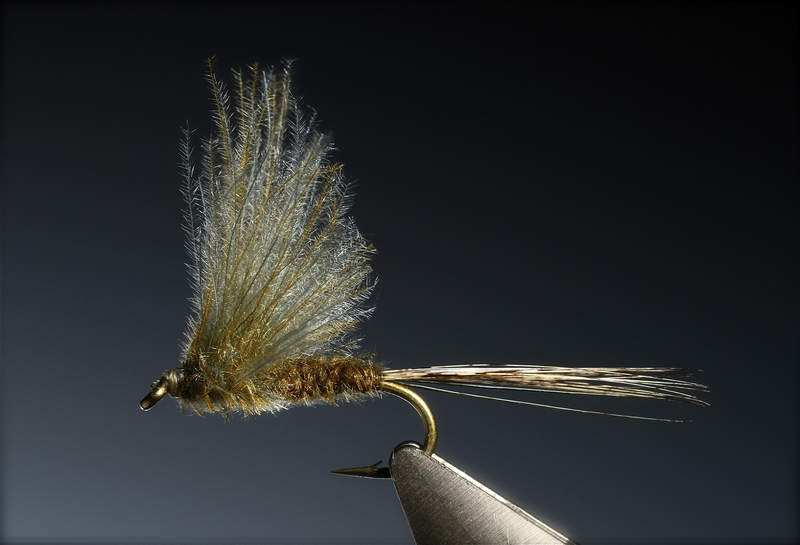 Now for the nymph legs. 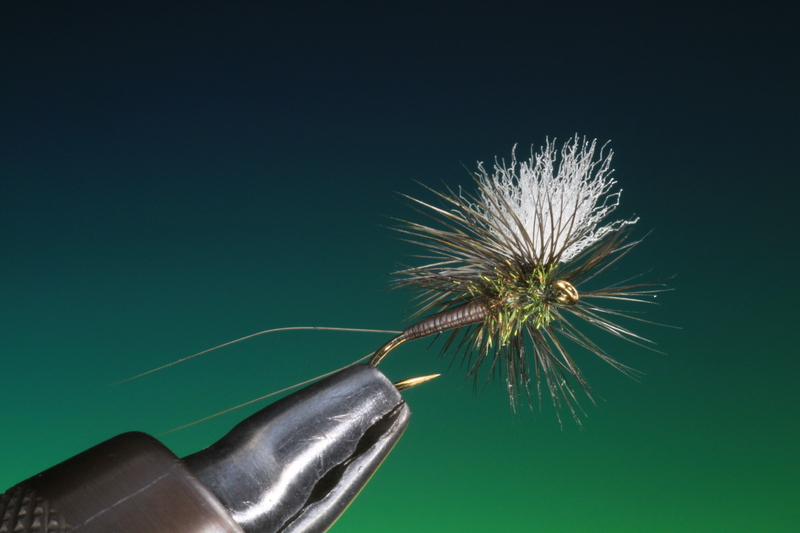 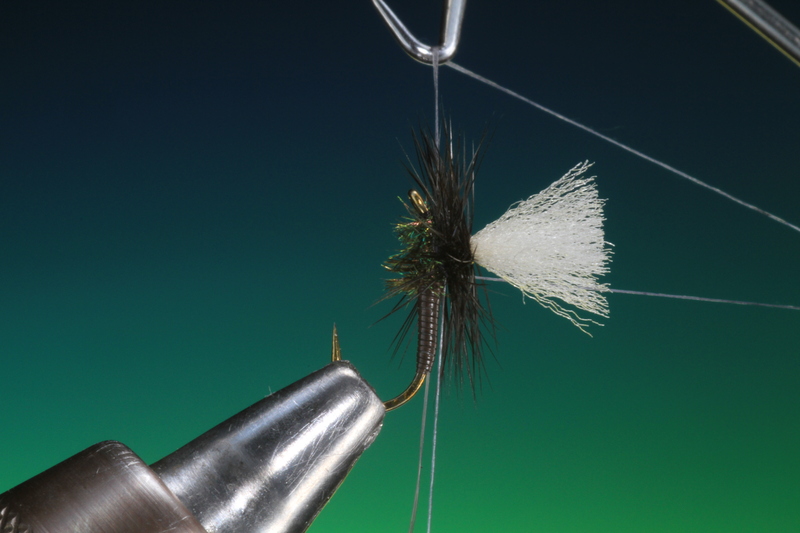 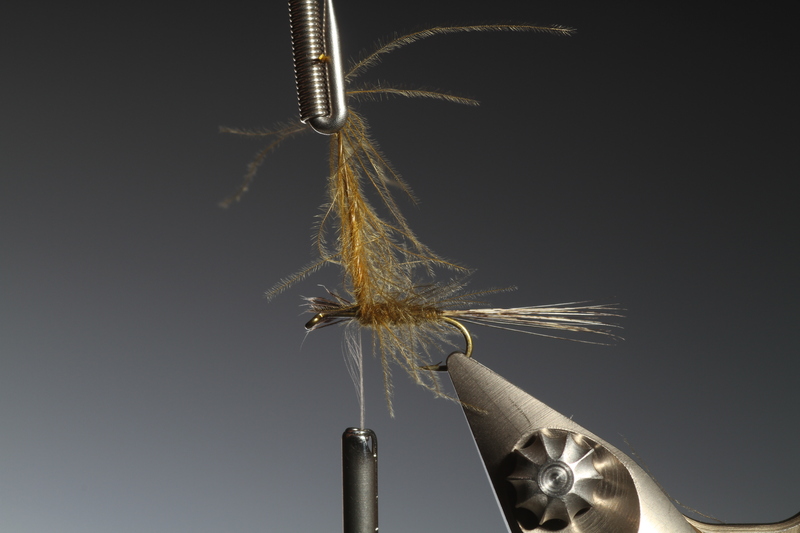 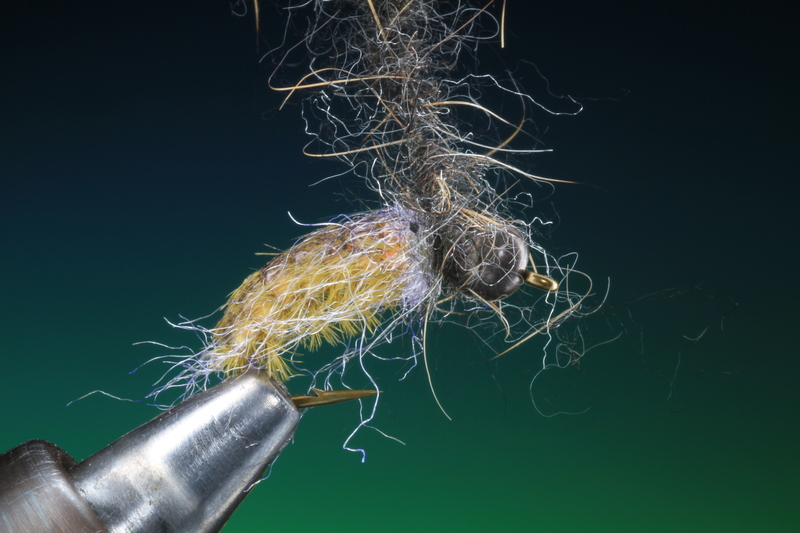 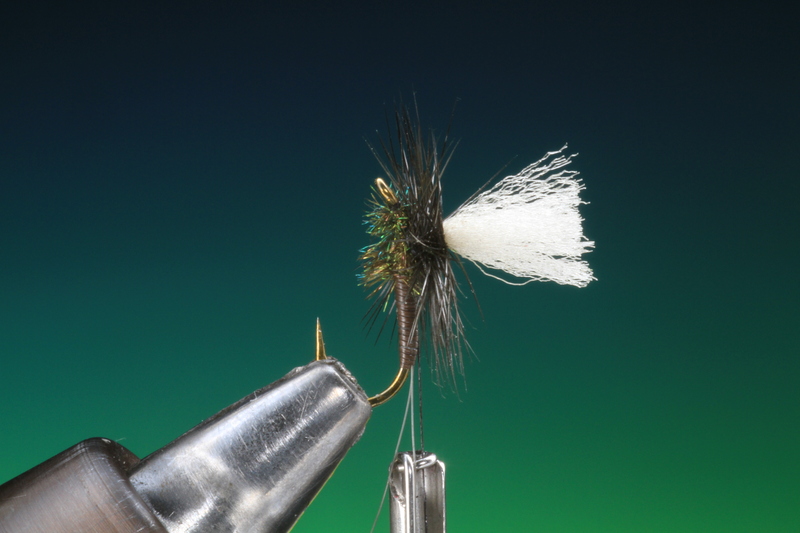 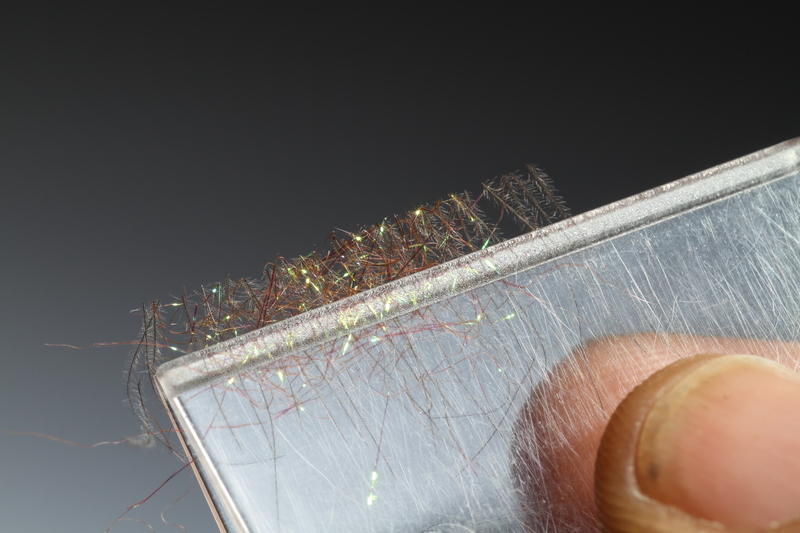 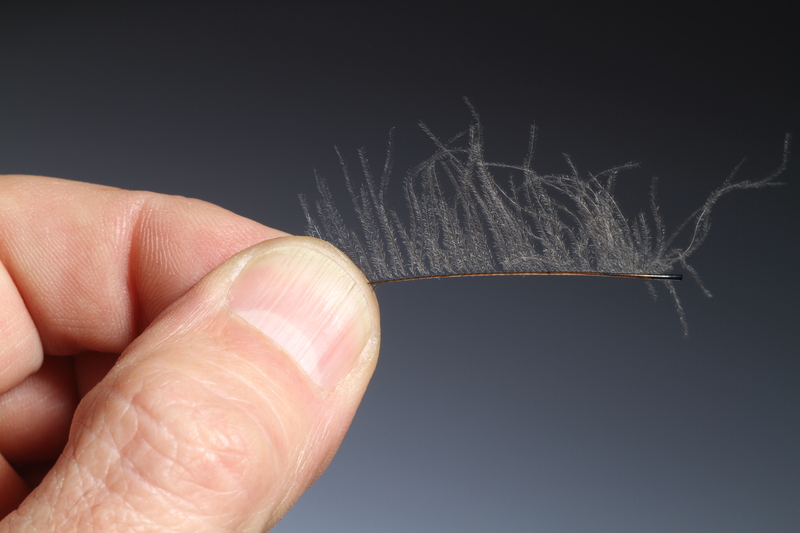 You dont need too much CdC fibers for this so remove the fibers from one side of the hackle. 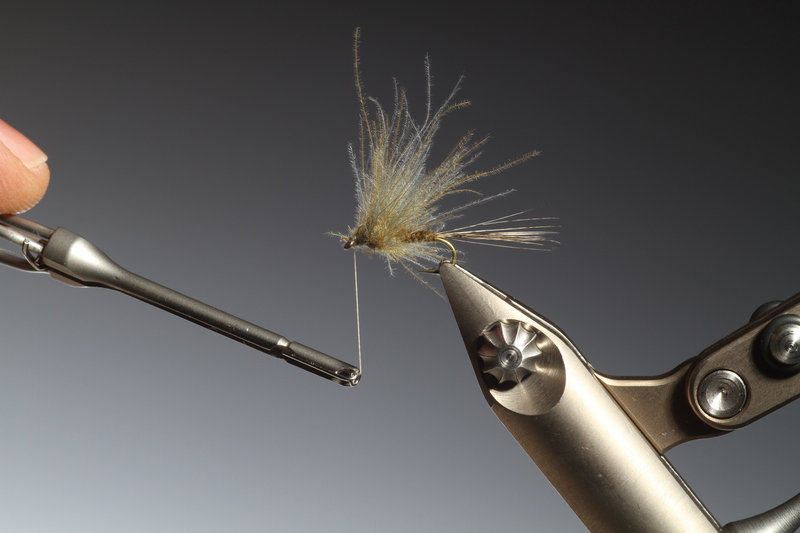 Place a small amount of Petitjean ice dub over the jaws of the smallest magic tool. 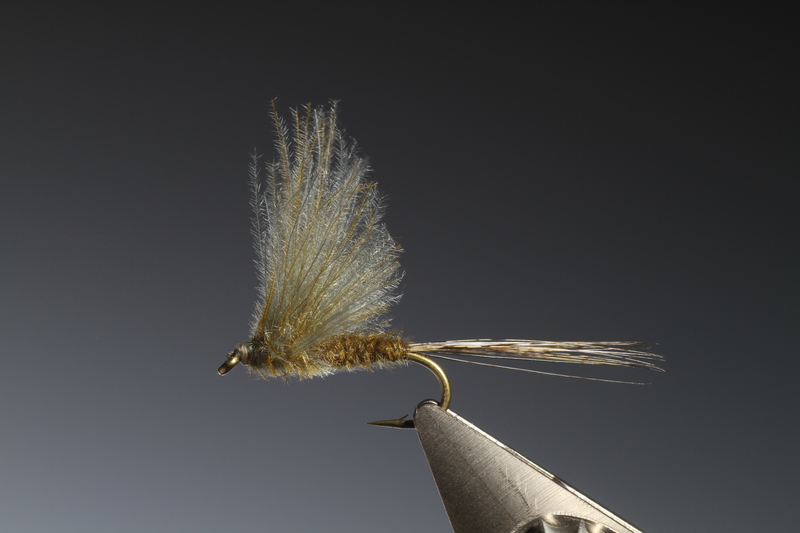 Take the prepared CdC hackle. 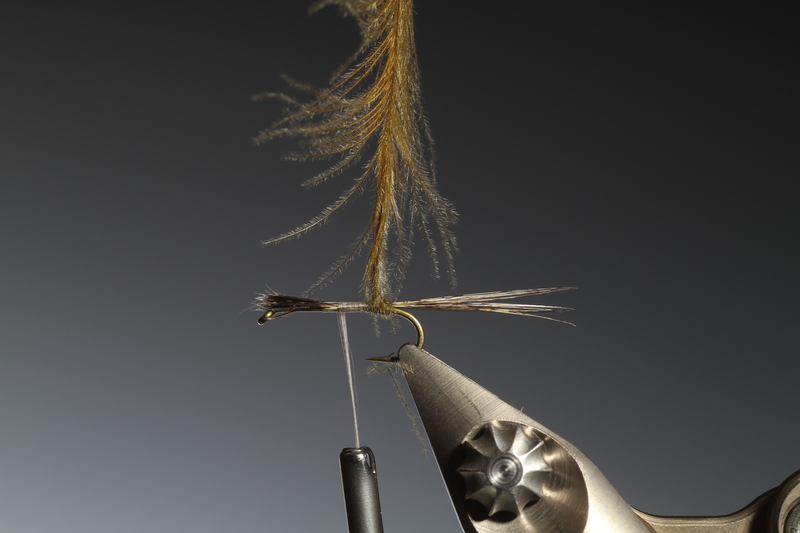 Holding the hackle with both hands pull it down on top of the ice dubbing and into the jaws of the Magic tool. 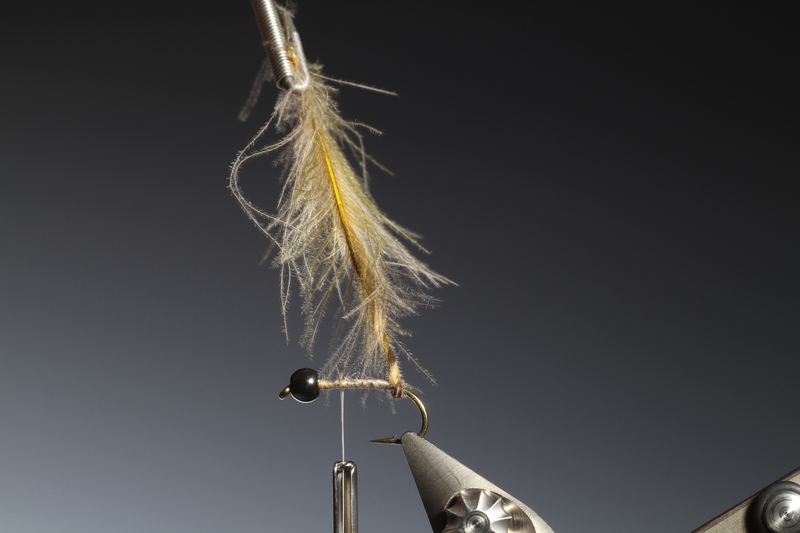 Now the hackle and dubbing should be in place in the jaws of the Magic tool. 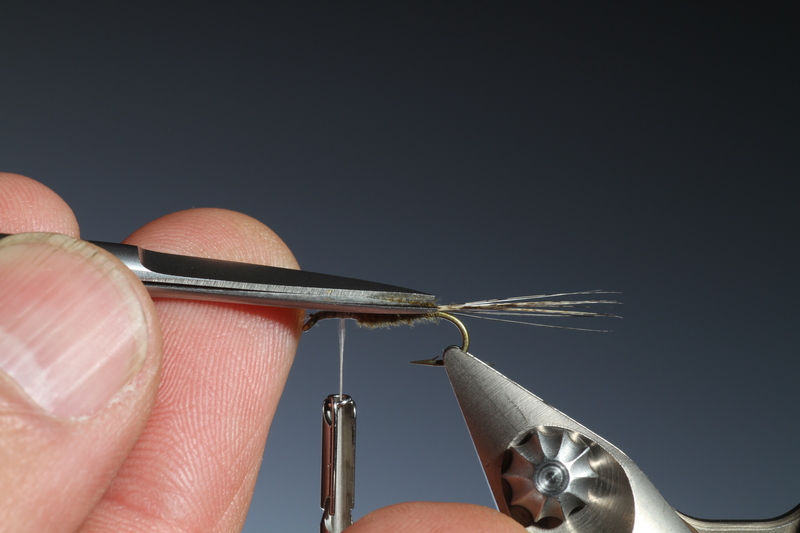 Now trim off the CdC ends on each side of the Magic tool jaws. 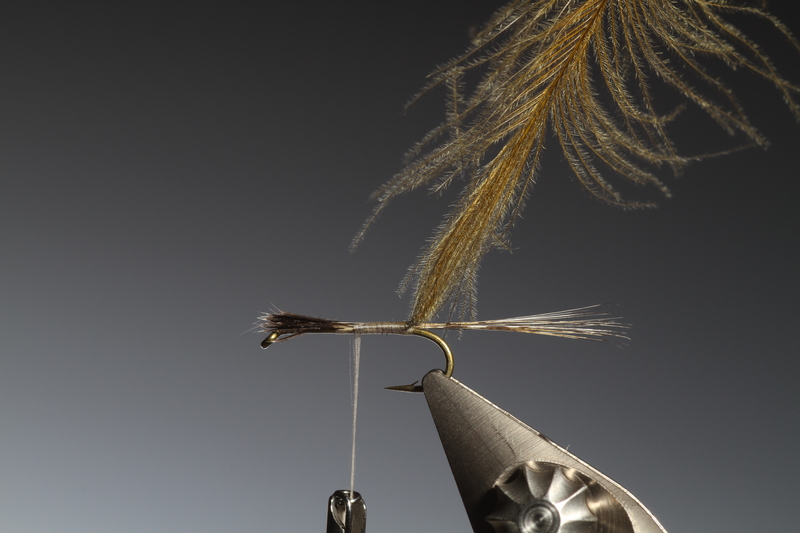 This is very important or the hackle will be caught in the magic tool spring when you try and remove it. 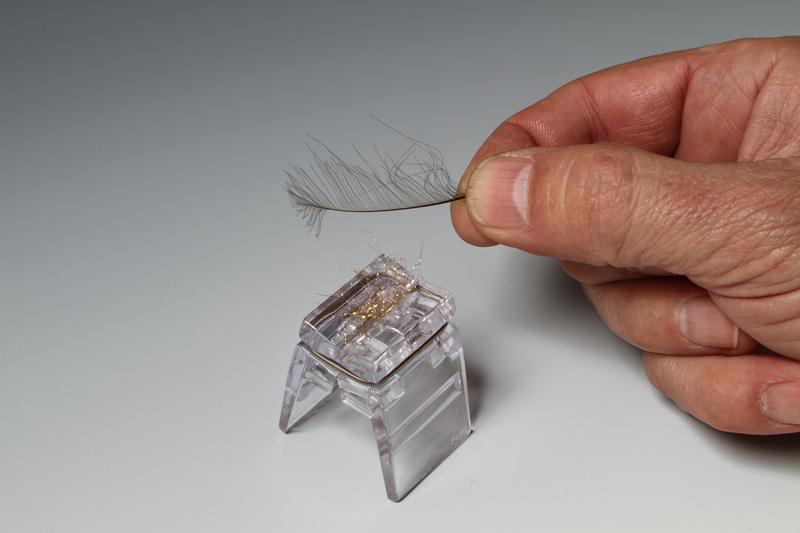 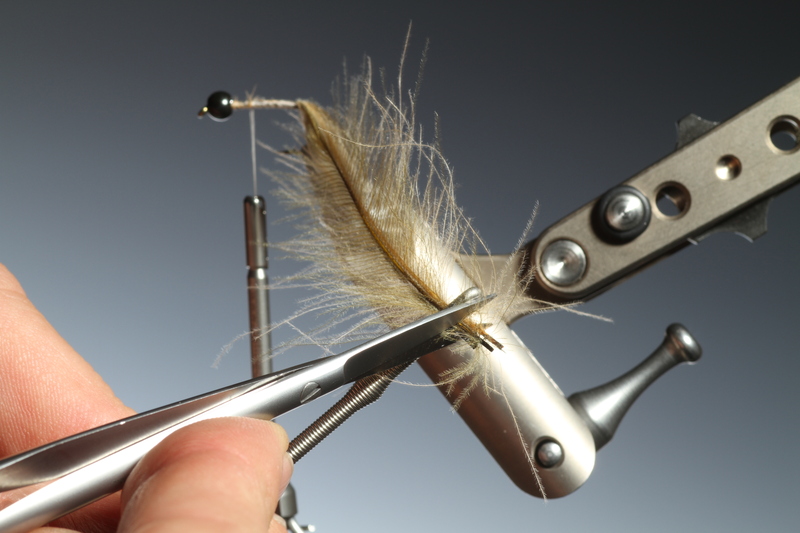 Transfer the hackle and dubbing to the magic clip tool and with straight scissors cut of the hackle stem. 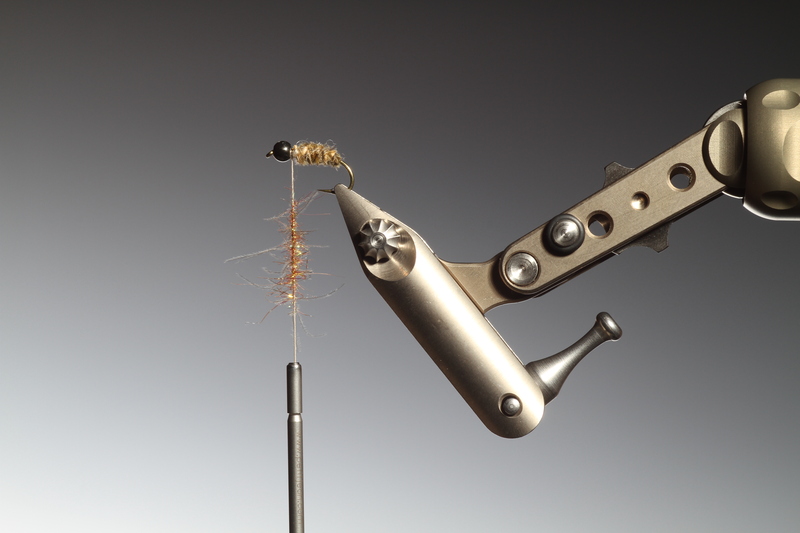 Put your loaded magic clip to one side and make a dubbing loop to spin the CdC in. 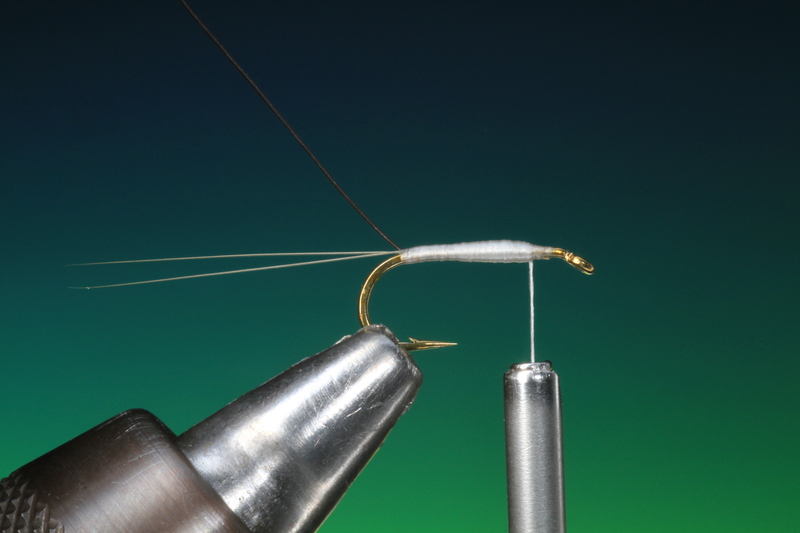 If you are using the Petitjean bobbin holder you can make the loop like this. 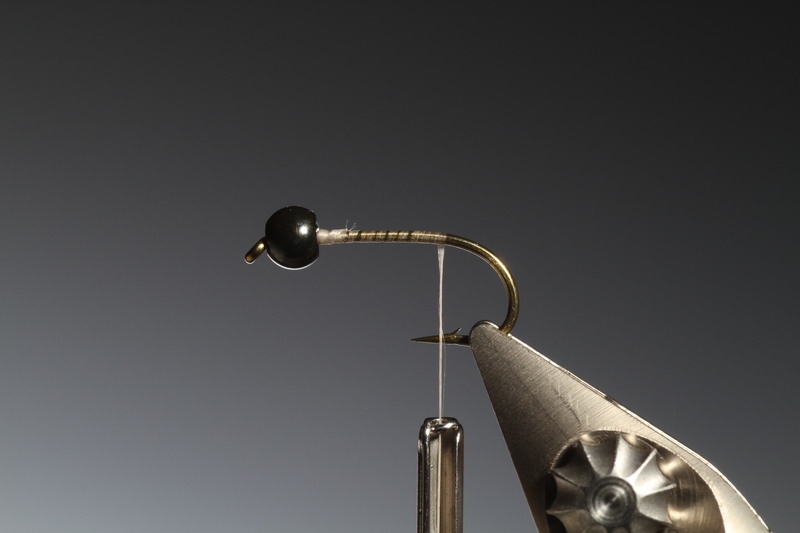 While holding the loop open with your finger push the bobbin end into the loop as shown. 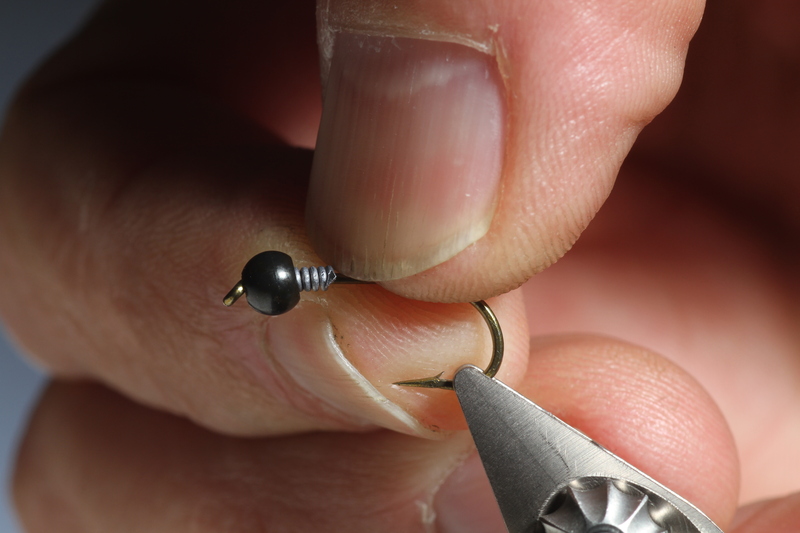 Remove your finger and rest the loop on the bobbin. 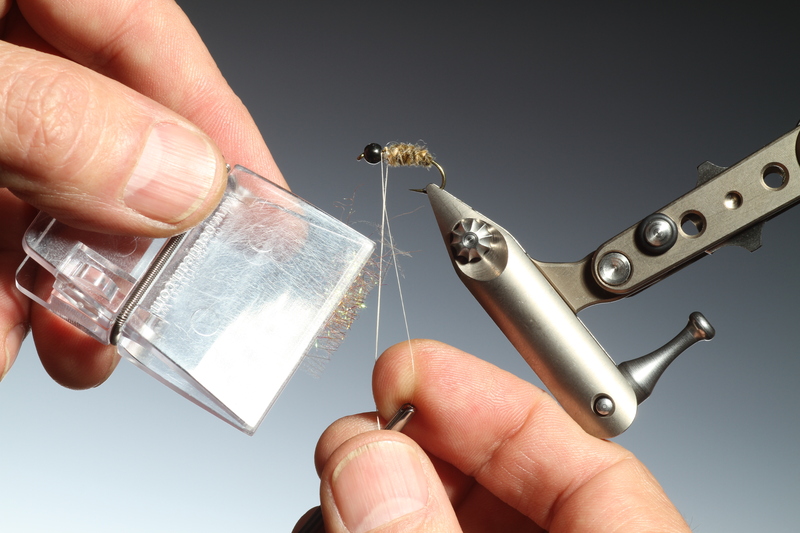 Slide the thread up the bobbin and as it recovers to a vertical position the loop will catch on the bobbin dubbing loop hook and hang there. 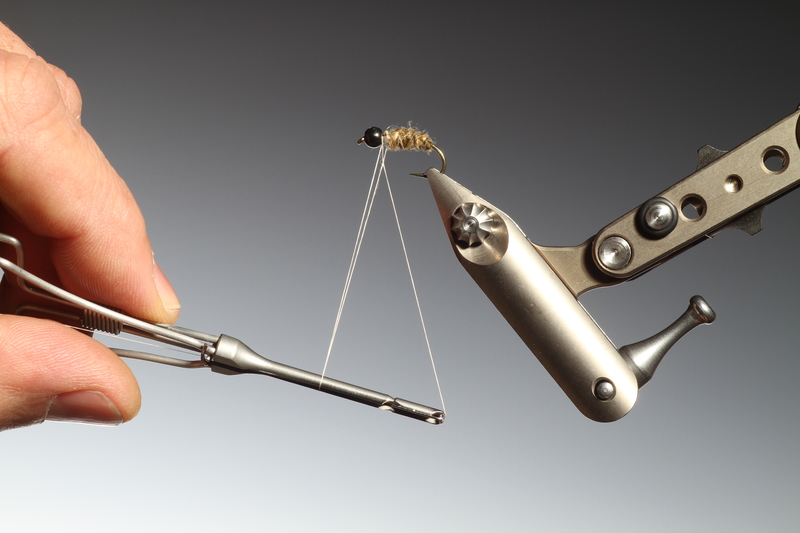 Open the loop with one hand and offer up the loaded magic tool. 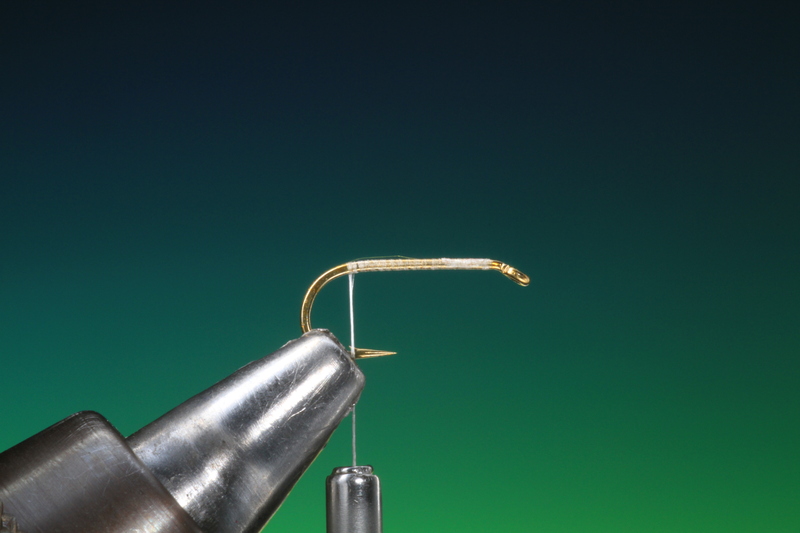 Place the fibers of CdC and ice dubbing in the loop and remove the magic tool clip. 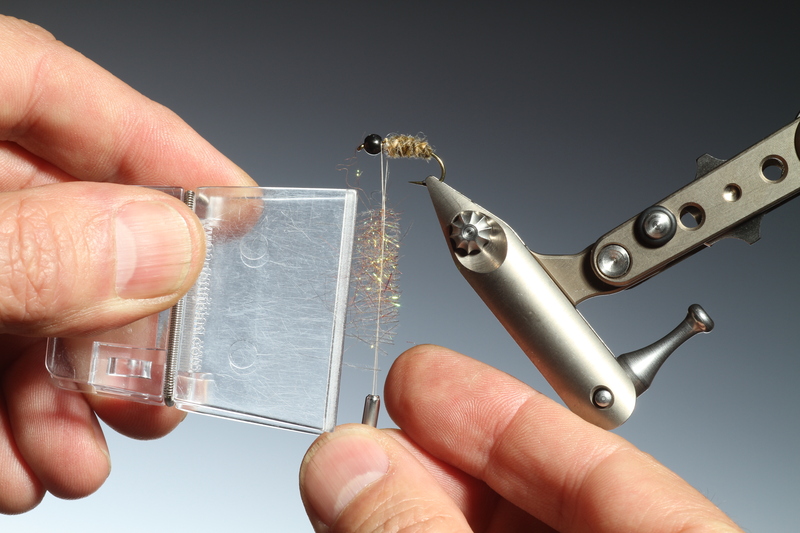 The material should be now trapped in the loop. 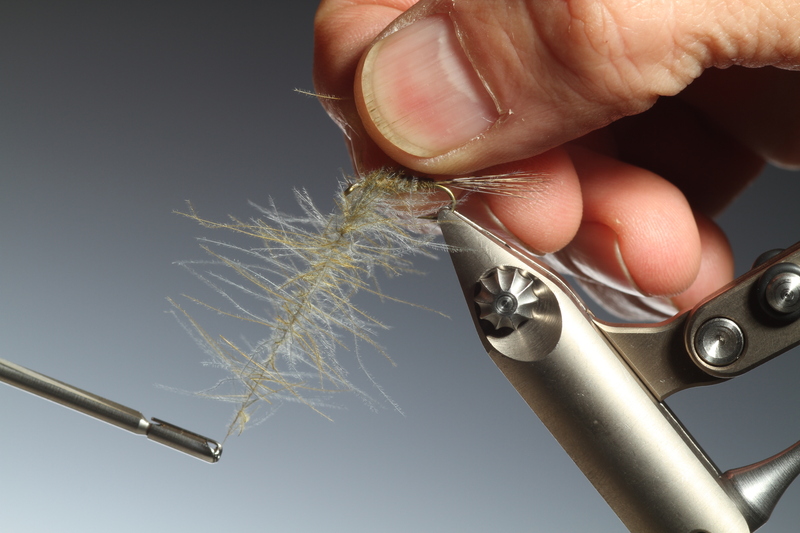 Twist the bobbin and spin the material into a dubbing brush. 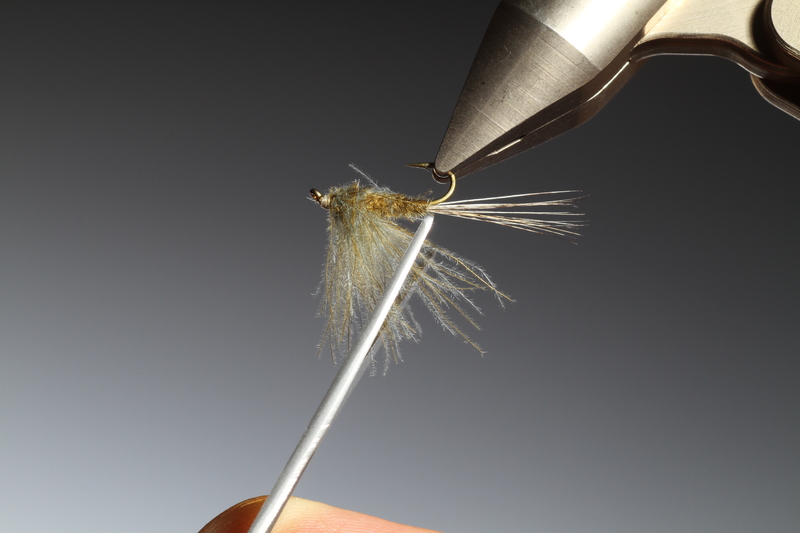 You can now wind on the dubbing brush to form the legs of the nymph. 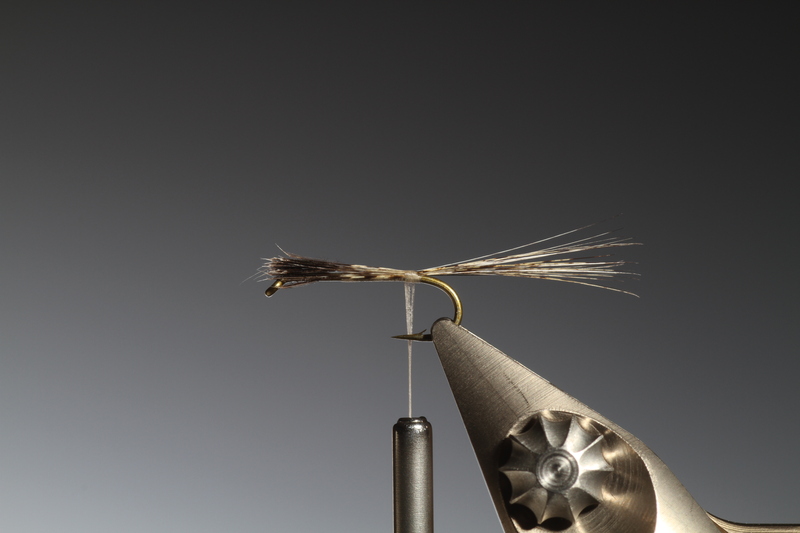 Once the dubbing brush is completely wound on tip your bobbin as shown. 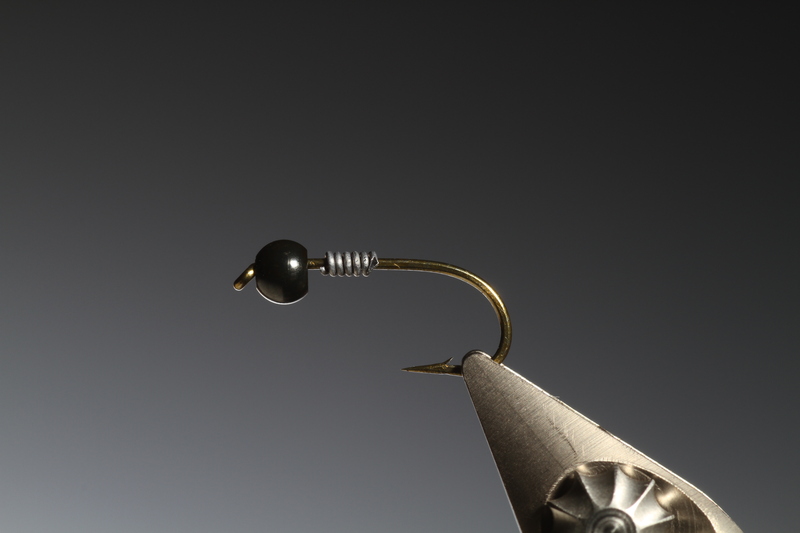 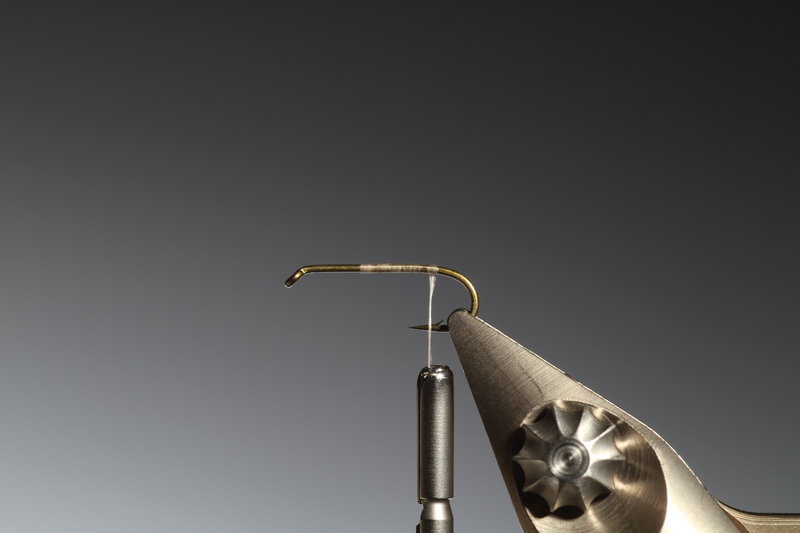 If you slowly increase the angle of the bobbin the loop will slide off the dubbing loop hook on the bobbin as shown here. 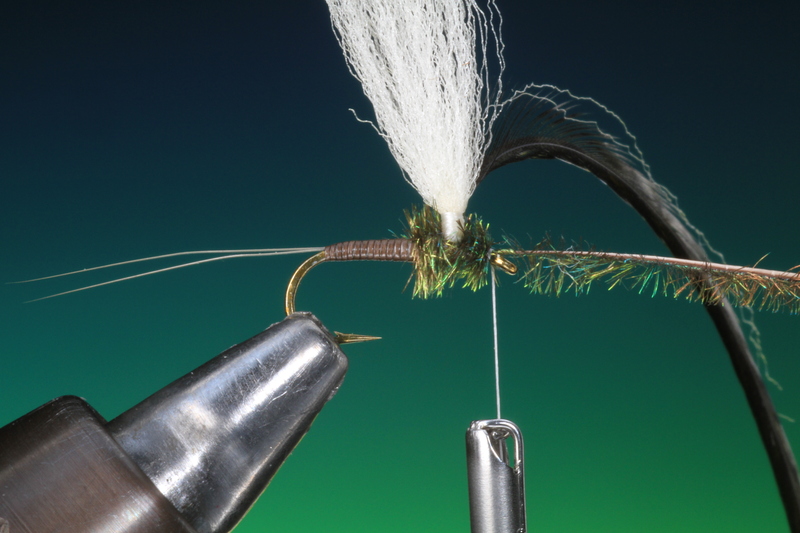 Make a couple of turns of tying thread just to secure the loop end behind the bead head. 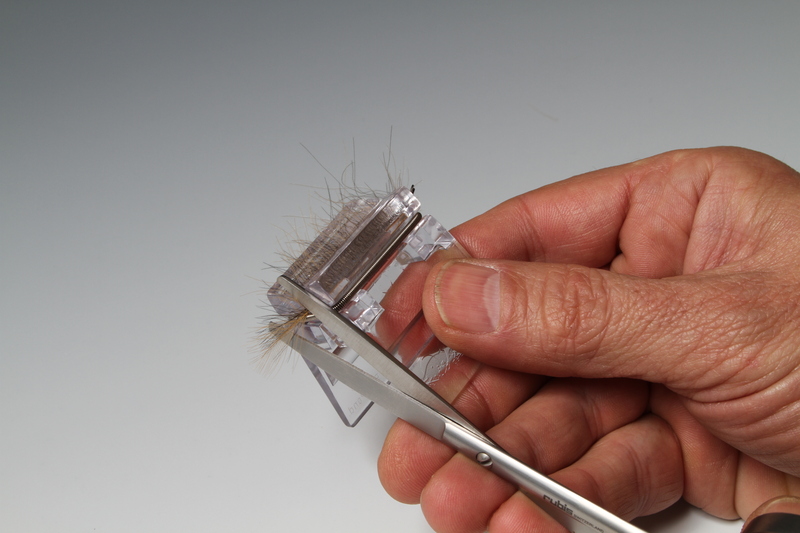 Trim off the remaining loop end. 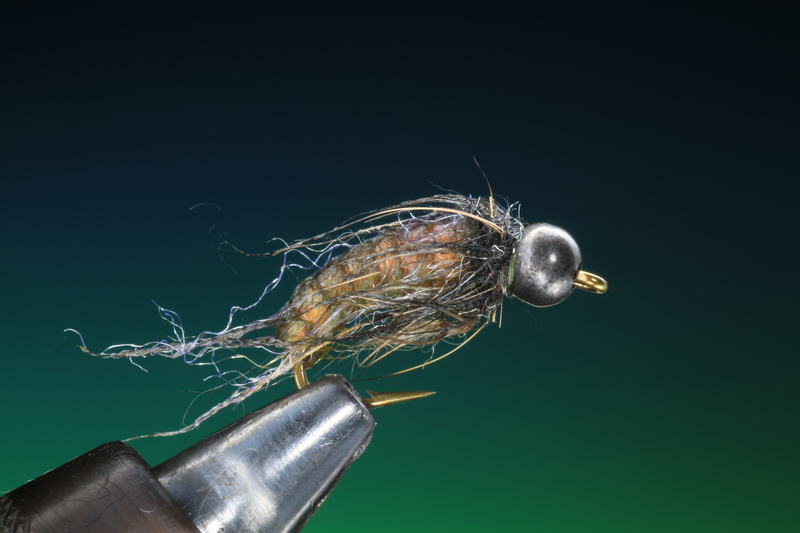 You can now whip finish the nymph tight into the bead head. 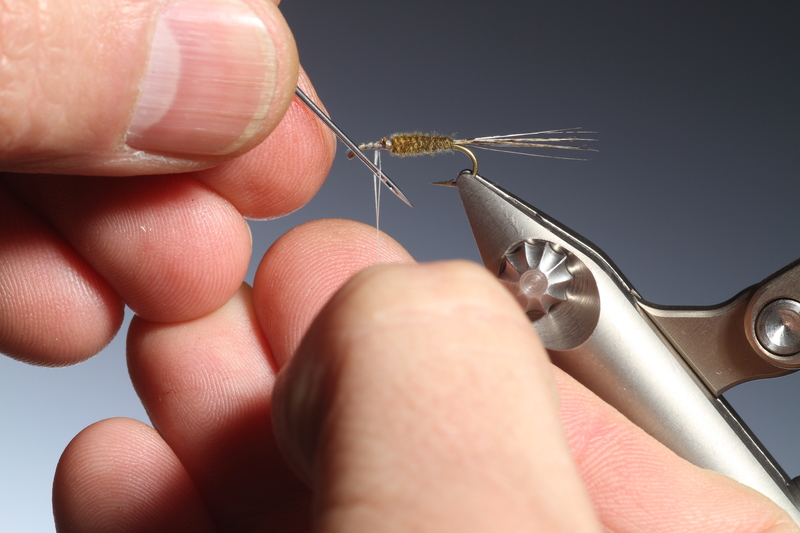 Remove the tying thread and you have your finished bead head CdC nymph.